Glittering and glamorous. Easy to wear. Luxurious from every angle. 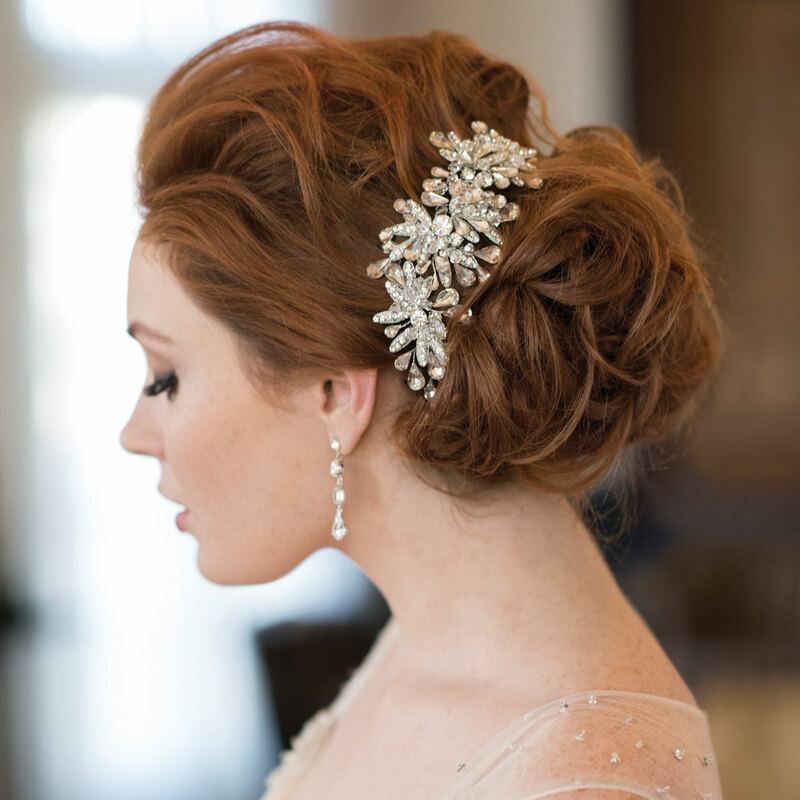 Wouldn’t you love to look and feel gorgeous on your big day? 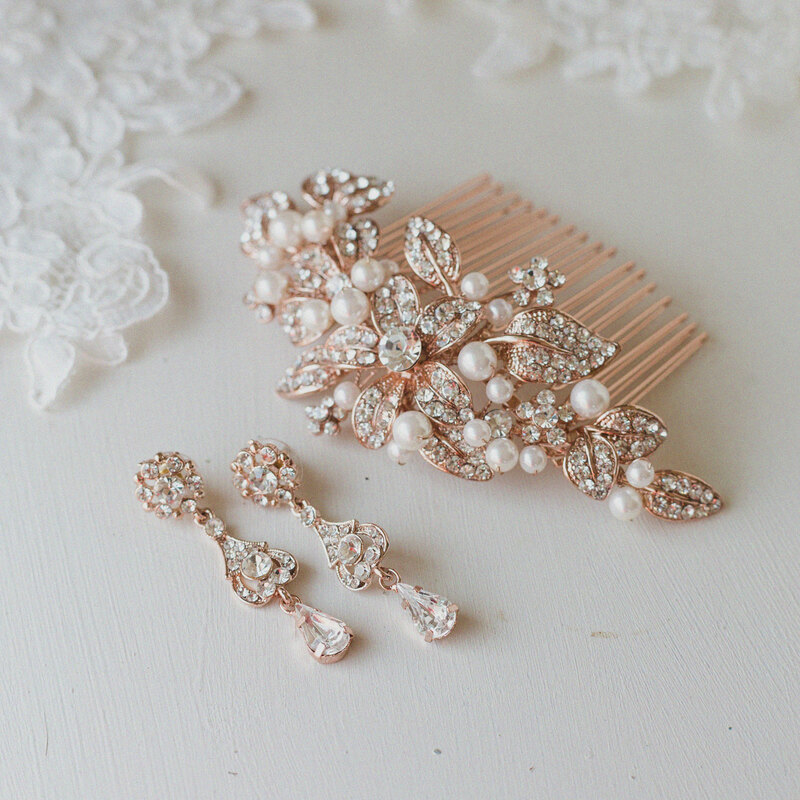 Complete the perfect outfit for your wedding with one of our enchanting hair accessories. Our bohemian and vintage-inspired hair vines, halos, and headbands evoke a free-spirited yet romantic look that is seriously swoonworthy. Pin your favorite and find it in a store near you! Fall in love all over again. 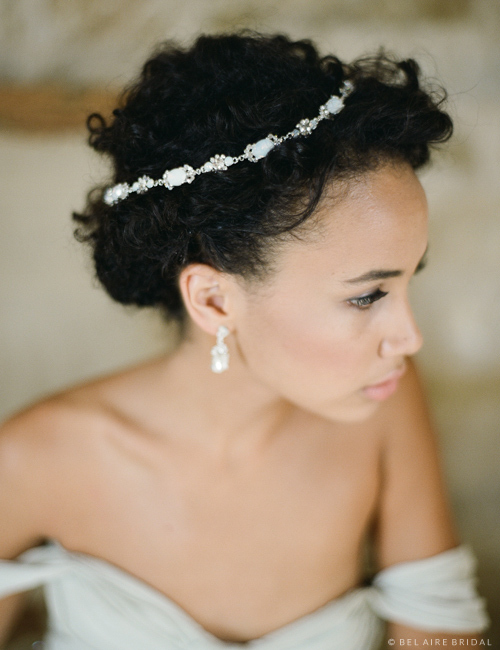 A beautiful bridal garland meanders over your tresses, glittering with clear crystals, pearls, and rhinestones. This boho-luxe design is flexible and ties in the back. 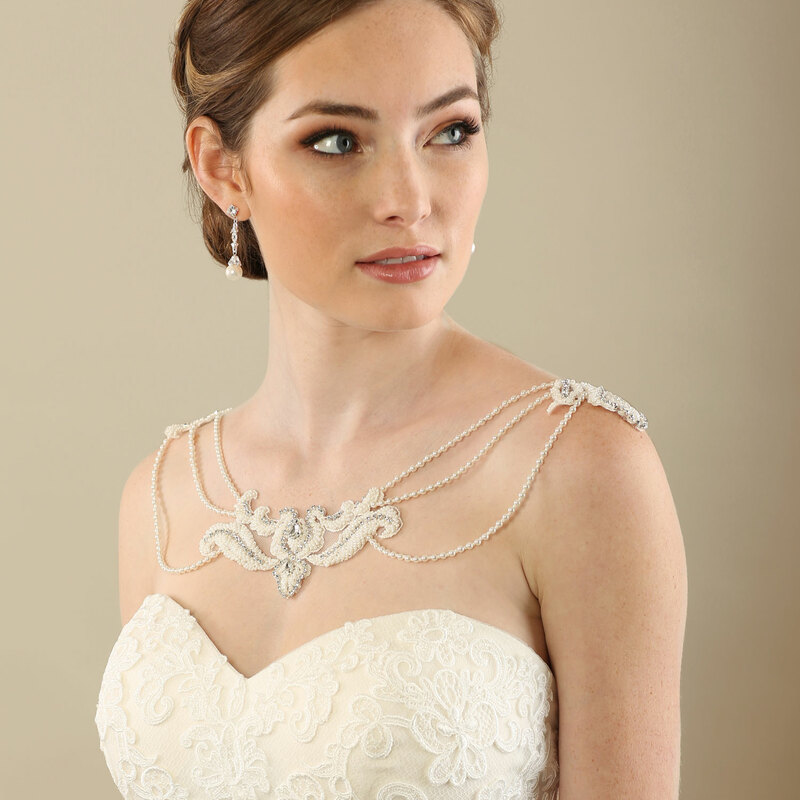 Pair it with a pearl or rhinestone trimmed veil for a delicate, feminine look. Glitter with celestial grace wearing this gorgeous rhinestone-studded halo. Sparkling with clear or opal rhinestones amidst silver filigree, this lovely design encircles your head with vintage-inspired beauty. Pair it with a matching bracelet and earrings to complete your outfit. Celebrate the finer things in life. This gorgeous tie headband features glittering rhinestones, gilded leaves, and metallic ribbon ties in a unique design. Pair it with gold or silver jewelry and a show-stopping veil. This is your day to shine! Get your glamour on! This lovely tie headband glitters with marquise rhinestones in a starburst design that beautifully enhances a vintage theme. 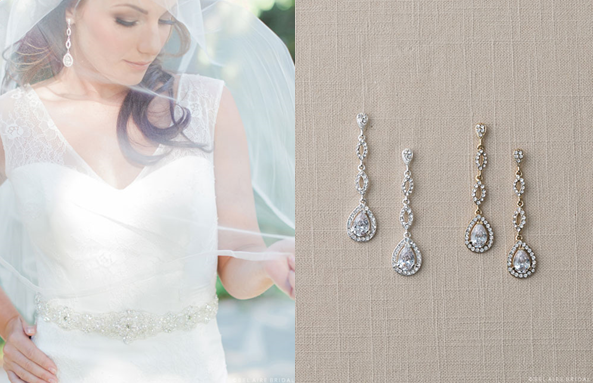 Showcase it with or without a veil, and add some drop earrings for seriously sparkly reception style. 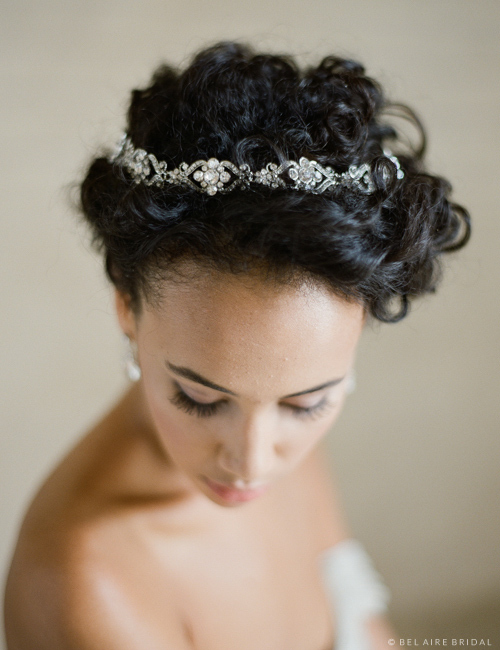 Exchange your vows wearing a glittering headpiece worthy of sonnets. This lovely linked rhinestone and filigree halo features gentle swirls and floral motifs. Available in silver or gold, this decadent design may be styled with a veil for an utterly romantic look. Slip into something casually beautiful. A flexible tie headband studded with pearls, metallic leaves, rhinestones and crystals creates a gorgeous bridal accent for your hair. Pair it with a veil for a formal ensemble, or wear it with sparkly jewelry for a boho-glam outfit. Want more inspiration? 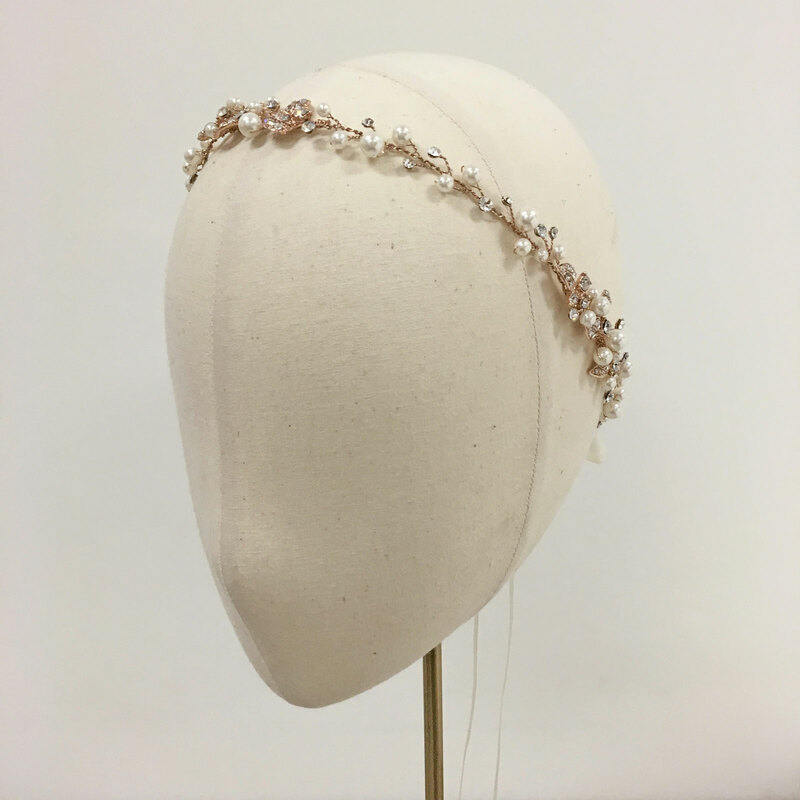 Check out our pretty headpiece collections, and follow us on Instagram for styling ideas! 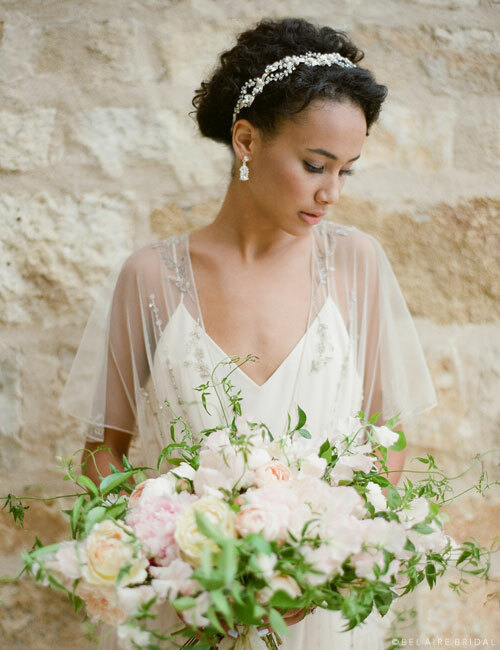 Are you styling a glamorous bridal outfit? 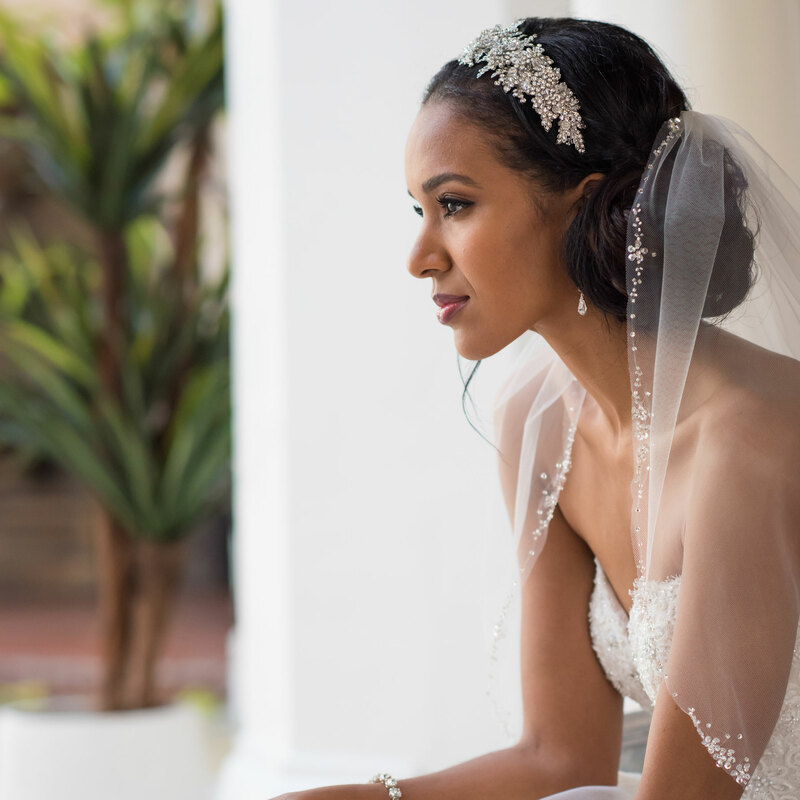 On your wedding day, you deserve to look and feel amazing. Over-the-top beauty is achievable and actually quite simple, once you choose the right accessories. You can build a gorgeous, unique bridal outfit with eye-catching jewelry, a dramatic veil, and a pretty hair adornment. 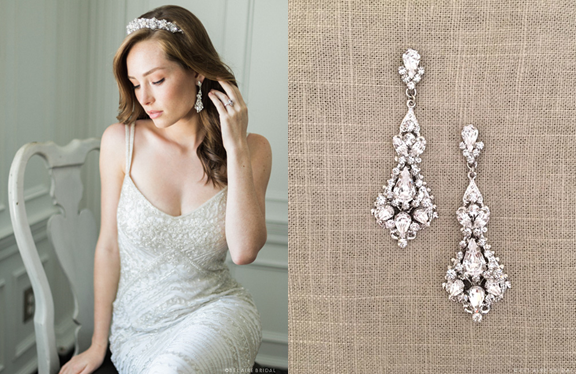 Choose these items with care—they will forever remind you of your big day! 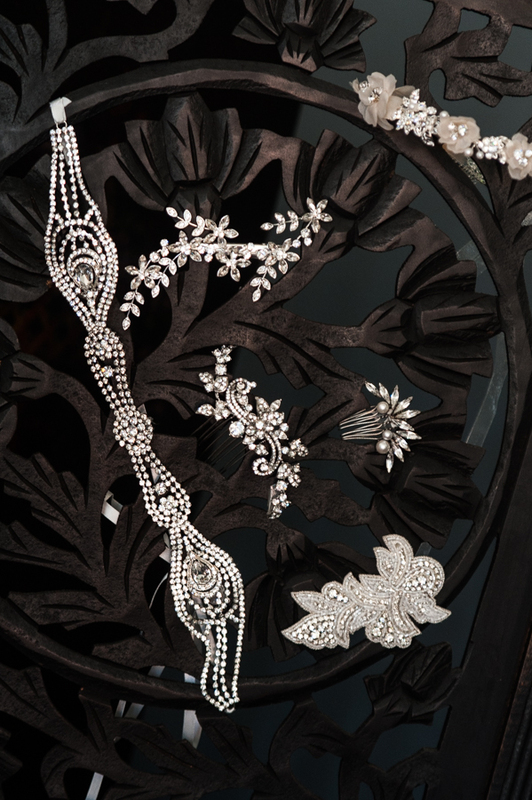 This week, we’re showcasing our most glamorous headpieces. 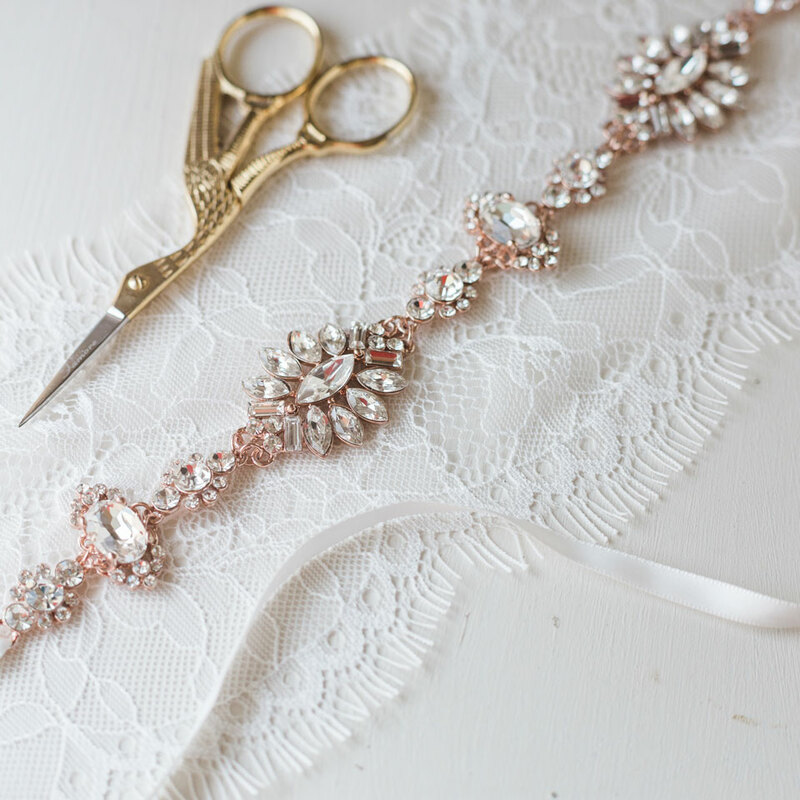 Make your wedding day extra sparkly! Packed with a variety of shimmering rhinestone shapes, this gorgeous comb slips into an updo with show-stopping elegance. Pair it with drop earrings for maximum impact. For a trendy twist, try on an opal rhinestone fascinator. Glittering with a variety of sparkly stones, this lovely design takes center stage. 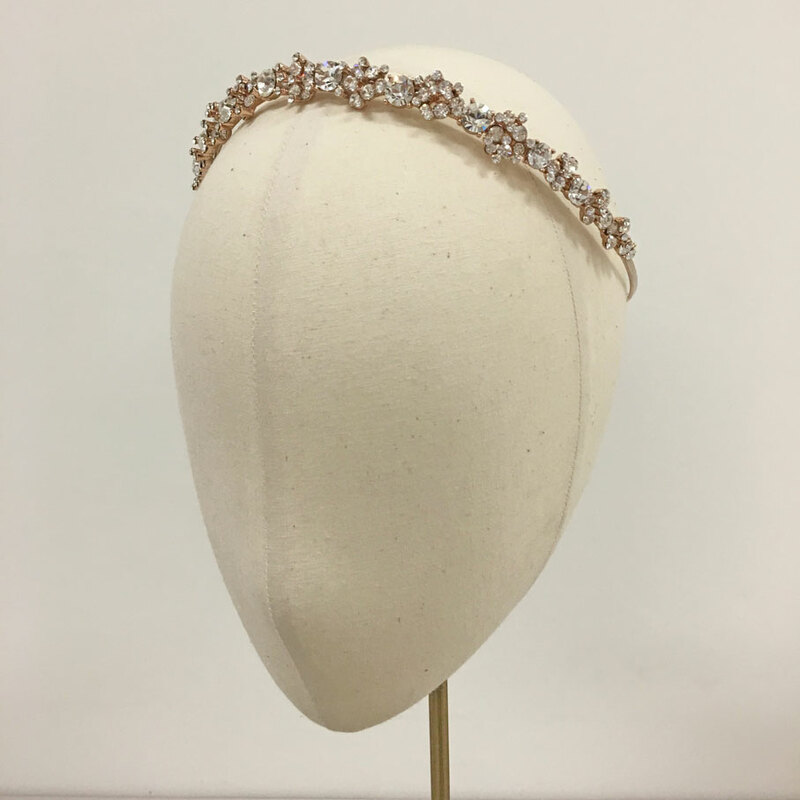 A quintessentially glamorous accessory, this design features clusters of rhinestones in a dense headband. Show off pure sparkle. Calling all princesses! This lovely crystal and rhinestone tiara crowns your ensemble with exquisite grace and beauty. Pair it with a veil for swoonworthy style. Top off your ensemble with a sparkling bridal halo. 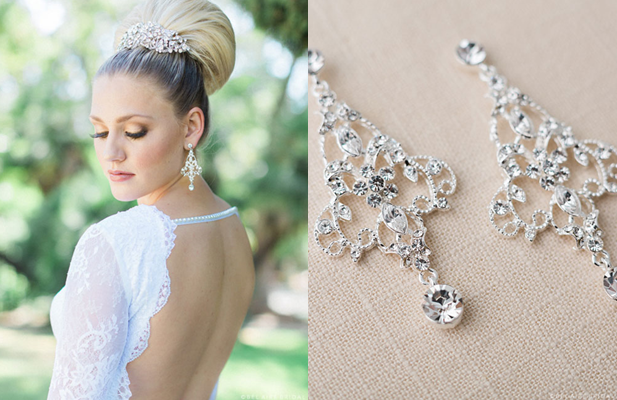 Silver filigree and shimmering stones create a charming accent that is beautiful with or without a veil. Enhance your hairstyle with a pretty rhinestone flower clip. Easy to wear and oh-so-sparkly, this decadent design adds a touch of feminine romance to your look. Give your ensemble a vintage twist with this shimmering tie headband. 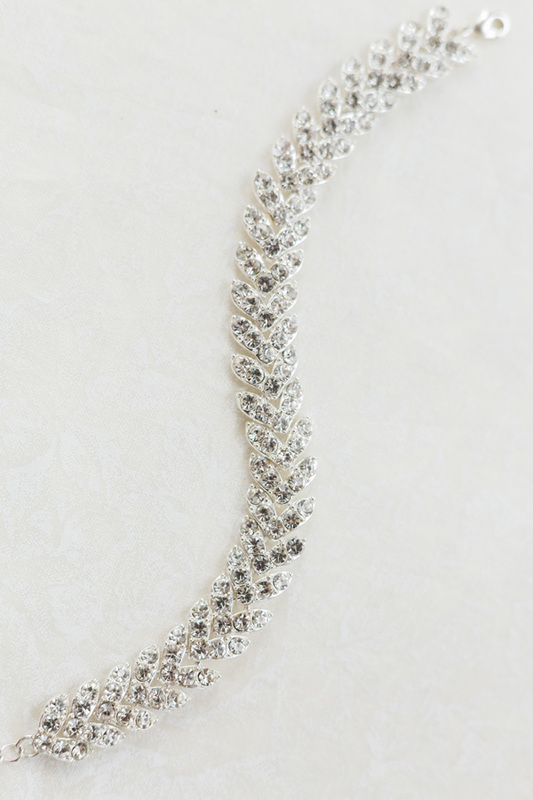 Marquise rhinestones create a dazzling design that can be worn in your hair or as a belt. 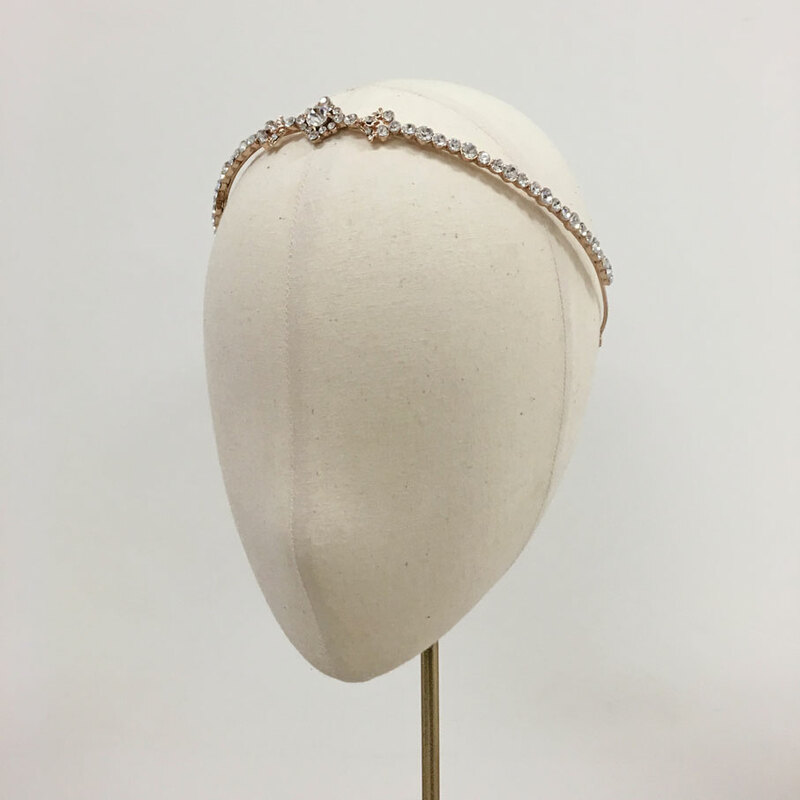 A classy alternative to a full-on crown, this contoured tiara headband features a sparkling line of rhinestones. This design is available in rose gold or silver. Want to explore more options? Check out our newest headpiece collection or browse our My Bridal Style: Glamorous page for ideas. Follow us on Instagram for the latest bridal news and styles! Romance is in the air. 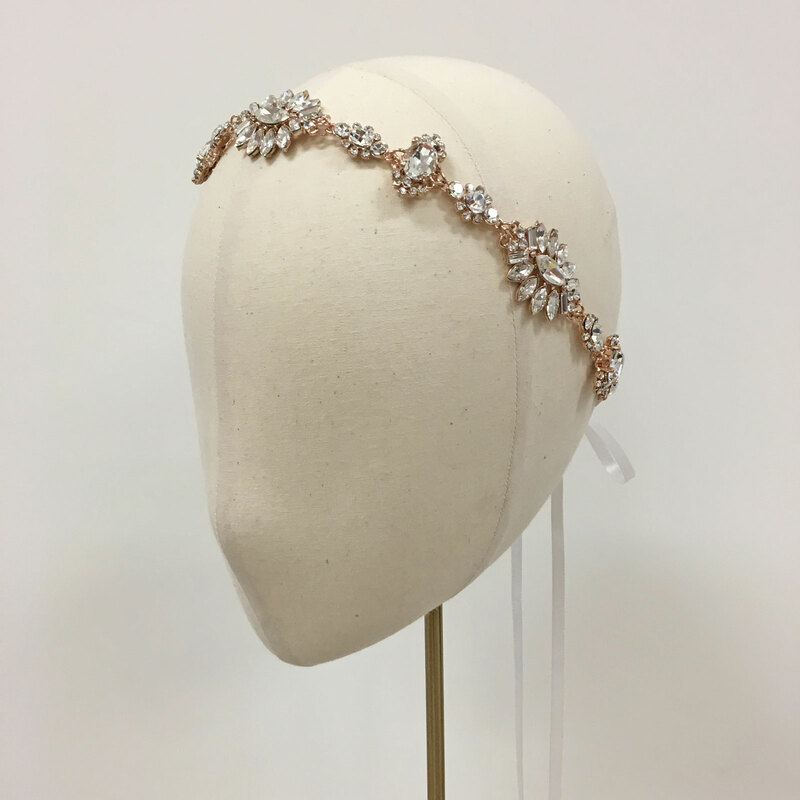 It’s the height of wedding season, and we couldn’t be more excited to release a gorgeous new selection of beautiful bridal headpieces in rose gold! 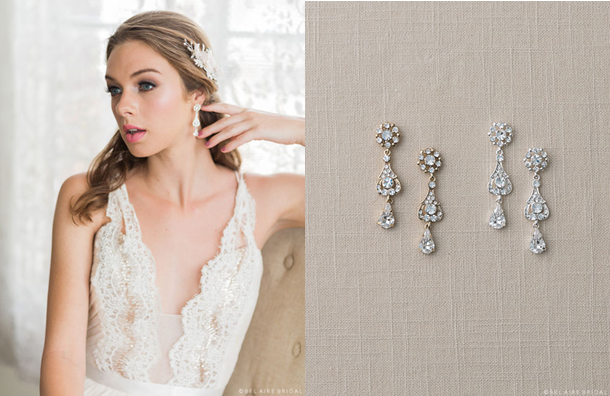 Bohemian, luxurious, trendy, vintage-inspired, and glamorous—we’ve carefully chosen a design for every bride. 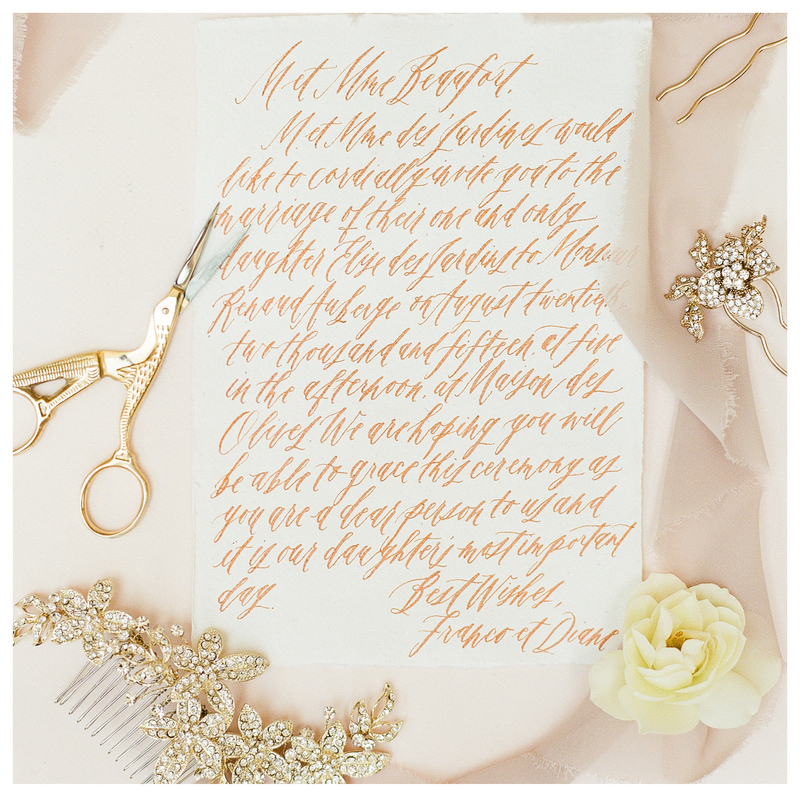 This lovely shade of gold blends the warmth of traditional yellow gold with the charming allure of blush pink. The results are literally stunning. 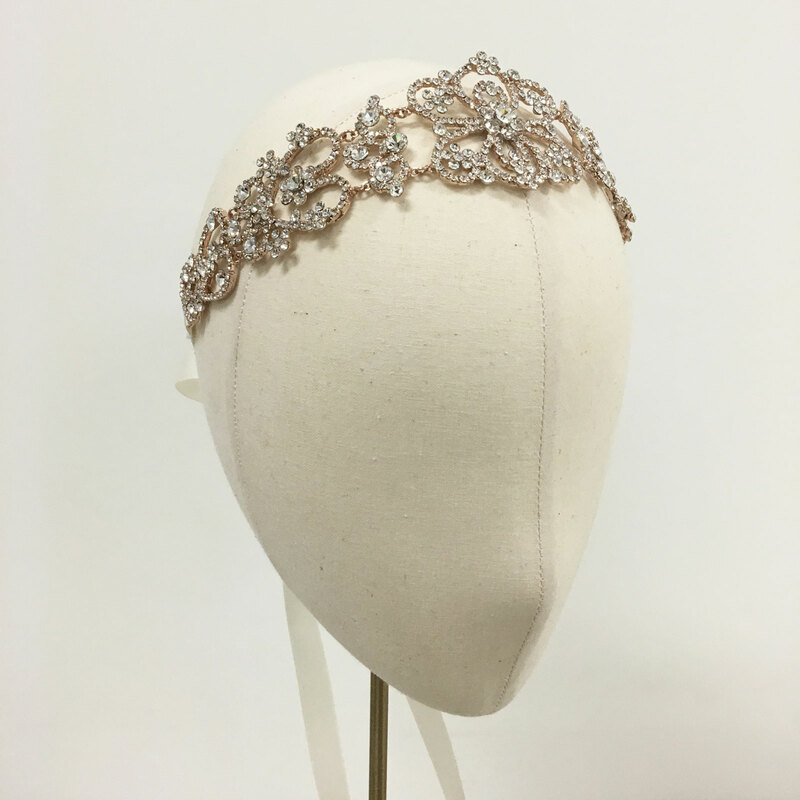 Scroll down to see some of our most popular headpieces in a whole new light. 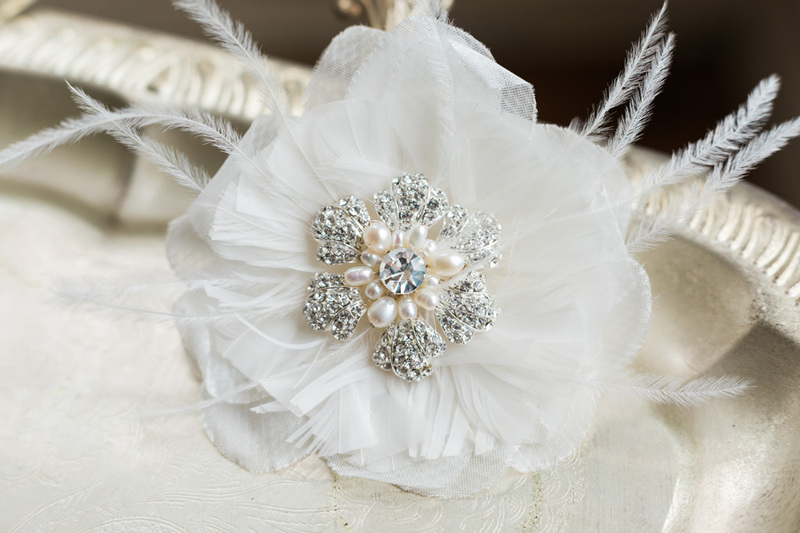 Sparkling, rhinestone-encrusted flowers with pearl clusters create a classic, beautiful bridal accent. 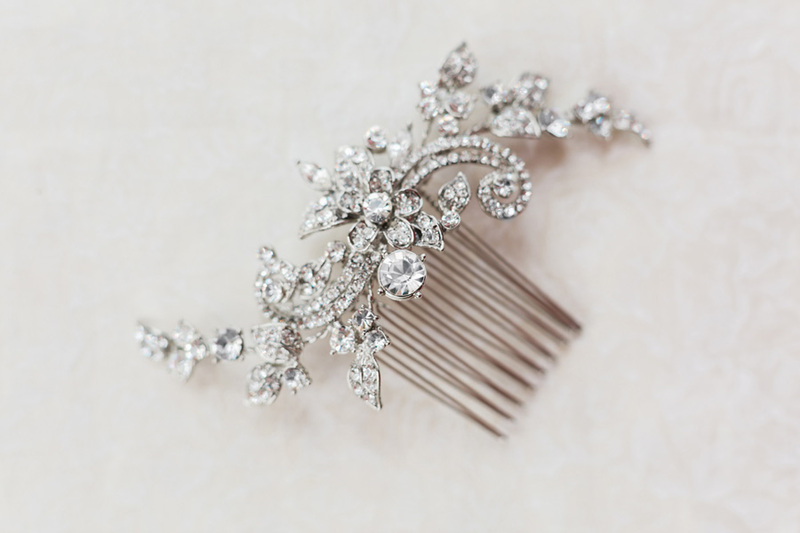 This lovely comb easily tucks into a chignon or updo, adding instant elegance to any outfit. 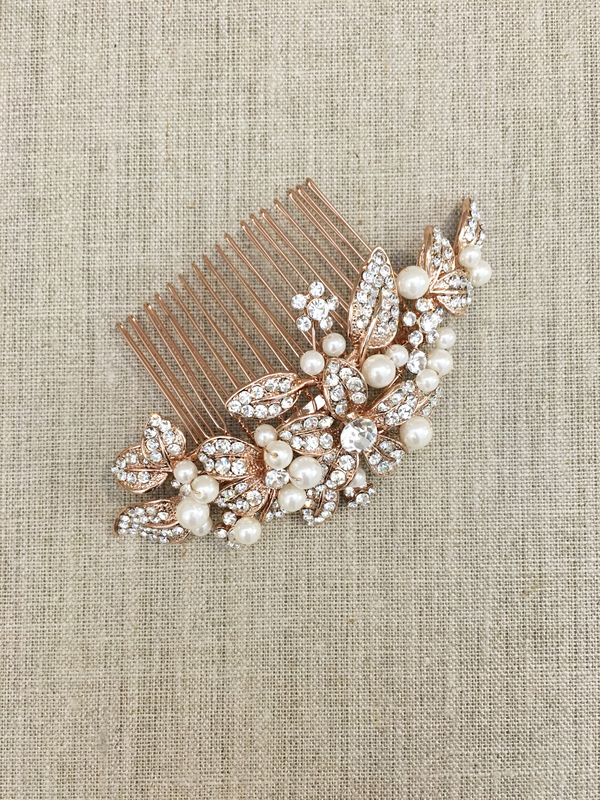 Style this comb in the back or on the side; pair it with a glittering rose gold belt or earrings to complete your look. One of our most romantic halos just got trendier! Create a beautiful, boho-luxe look with a gorgeous linked metallic halo shimmering with round rhinestones. 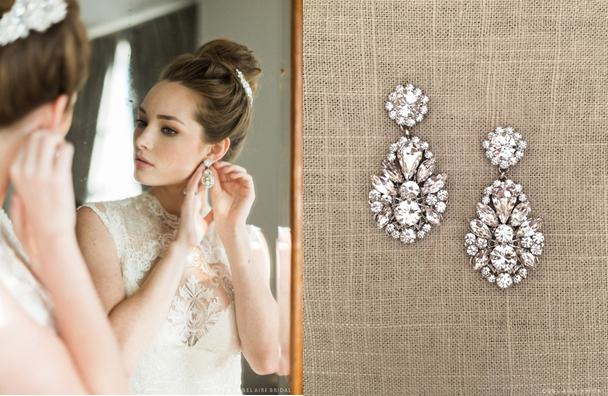 Floral filigree and stunning sparkle make this design a must-have for a wedding in any season. Style this with a veil for a truly incredible ensemble. Other color options: Gold, Silver. Slip into something gorgeous. Rhinestone-encrusted floral swirls create a luxurious pattern of eye-catching sparkle. This regal design transforms any gown with legendary beauty. Wear it as a sash for a trendy accent, or style it as a tie headband for serious wow factor. Other color options: Silver/Ivory, Silver/White. 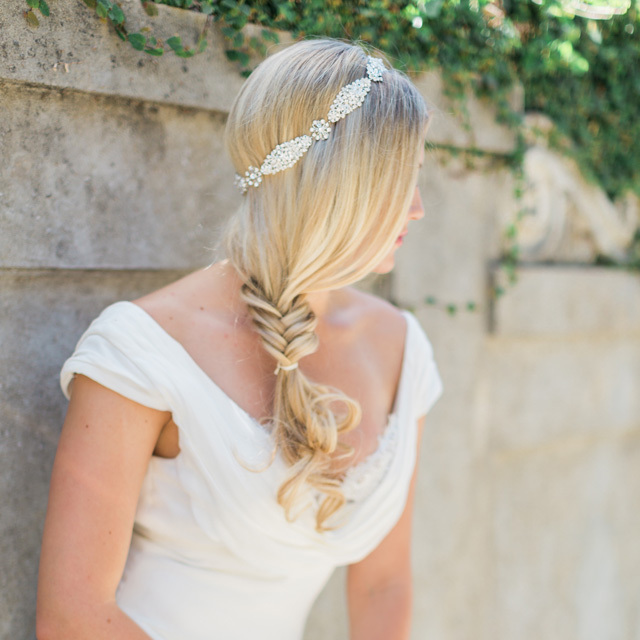 Kiss your bridal hair style with a touch of sparkle. 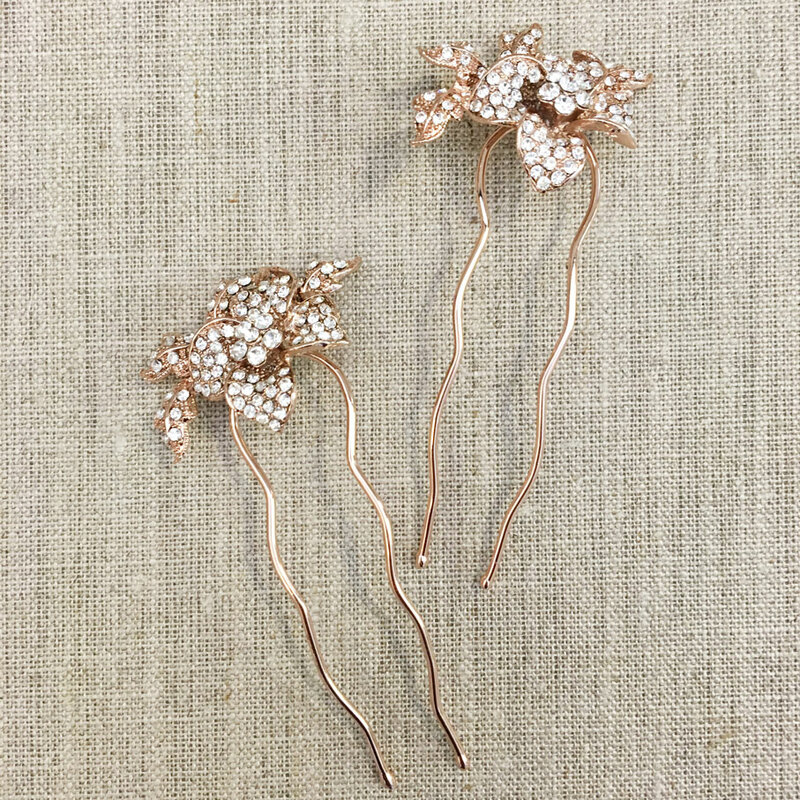 A pair of whimsical, rhinestone-encrusted floral pins glitters with subtle beauty. 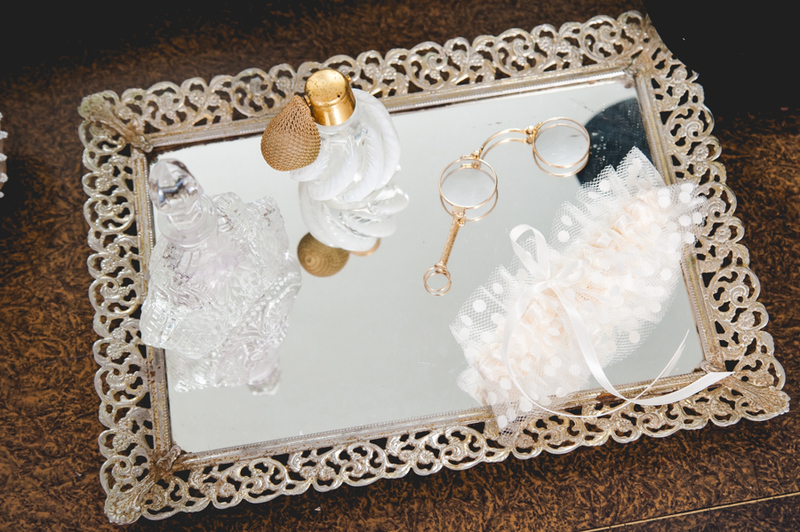 Style this in a vintage-inspired updo with trailing curls, or gift these little favors to your bridesmaids to complement their gowns! 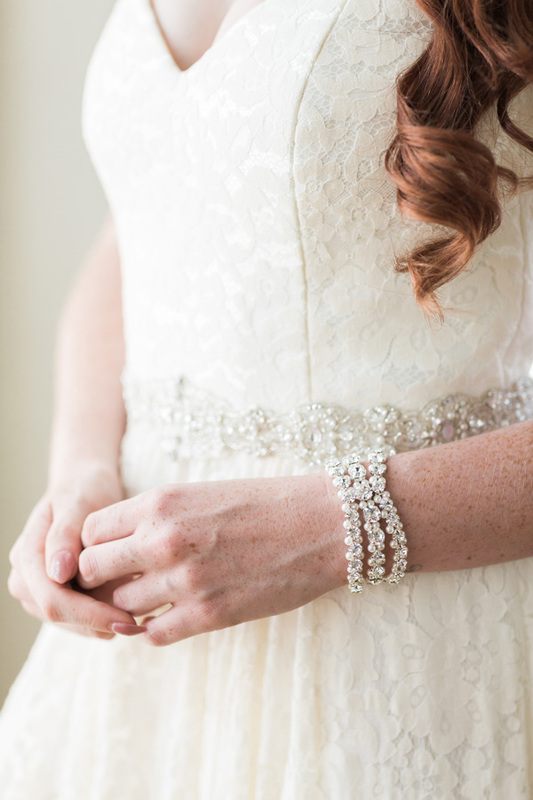 Beautifully bohemian, this lovely design incorporates pearls and fairy-tale sparkle in a modern design. A flexible metallic hair vine with lustrous glass pearls and delicately wired rhinestones ties on sheer organza. Weave it through a braid or wear it as a headband to personalize your look. Other color options: Gold/ivory, Silver/ivory, Silver/white. 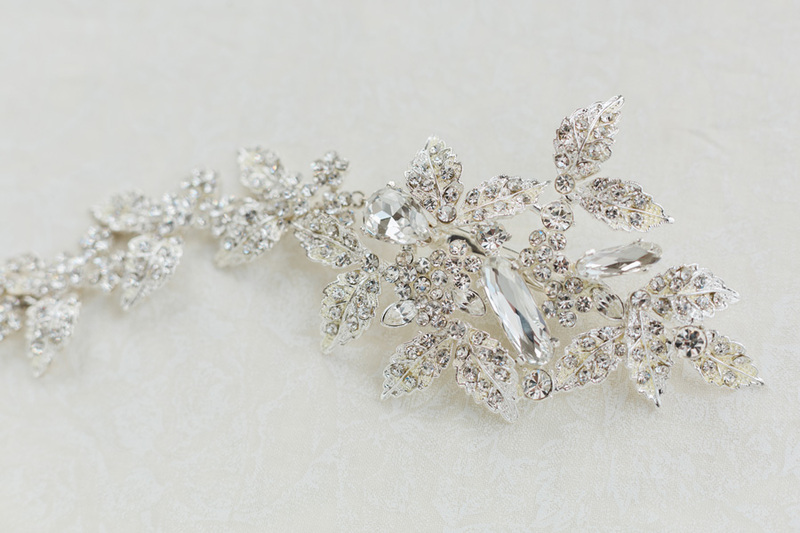 Sparkling marquise and oval stones dominate a gorgeous, vintage-inspired headband. 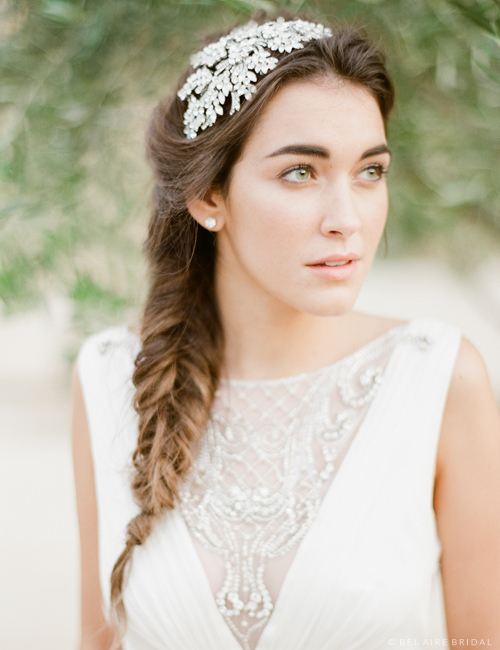 Glittering in a magnificent design of shimmering filigree, this metal-link headband exudes dramatic beauty. Tie it on as an opulent headband or belt to express your own style. 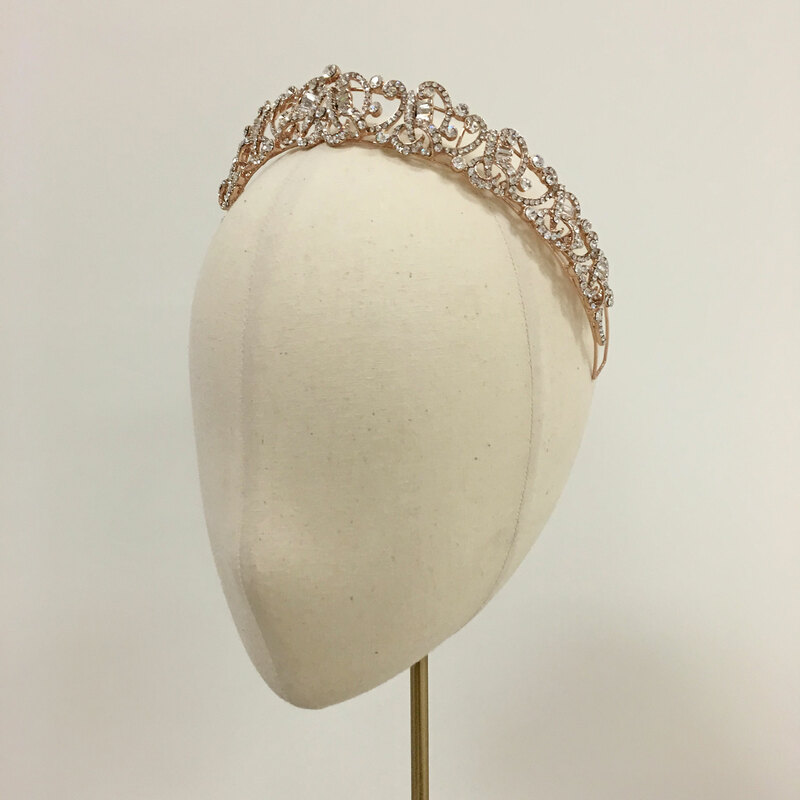 Show off an eye-catching bridal tiara in trendy rose gold! 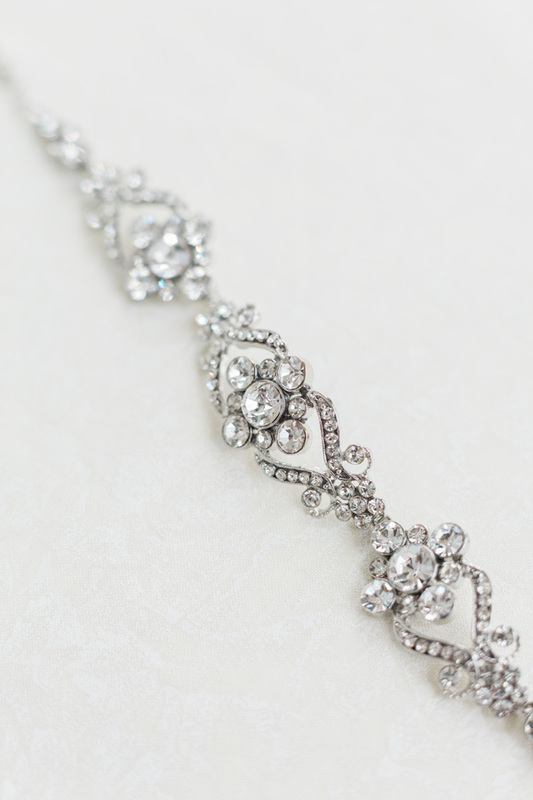 Reign over your fairy-tale wedding with this gorgeous design of sparkling swirls and rhinestones. Best paired with a dramatic gown and veil, you’ll add just a hint of magic with this elegant, romantic finishing touch. Sometimes, it’s the simple things you appreciate the most. 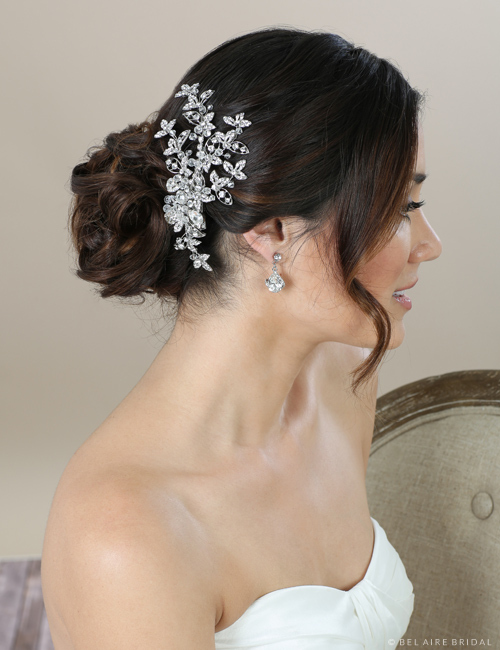 A sparkling halo of narrow rhinestones and floral motifs encircles your bridal hairstyle with feminine allure. 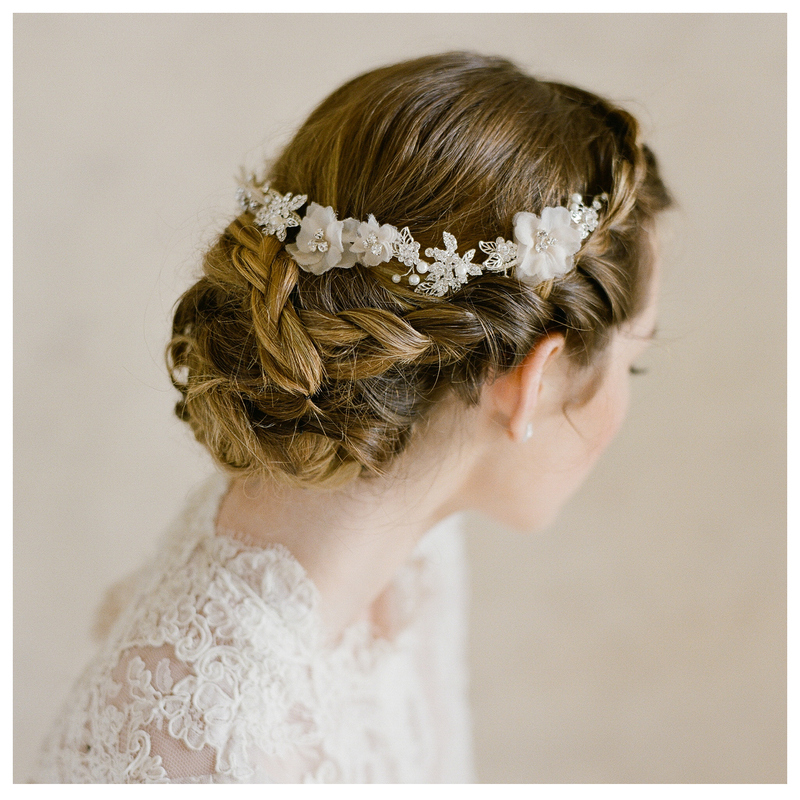 Style this lovely, boho-luxe design with a veil for maximum romance, or wear it alone as a light accent piece. Vintage-inspired yet oh-so-chic, this ornate design combines rhinestone swirls with small, sparkling flowers in an artistic pattern. 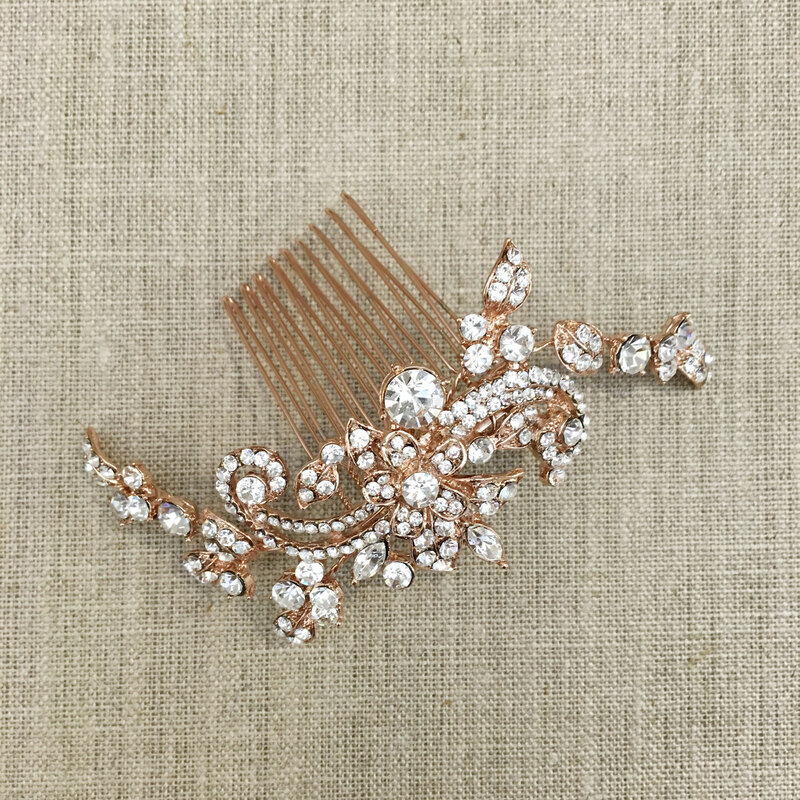 Classically elegant, this shimmering comb beautifully complements any romantic ensemble. Style this with luxurious rose gold earrings to complete your look. 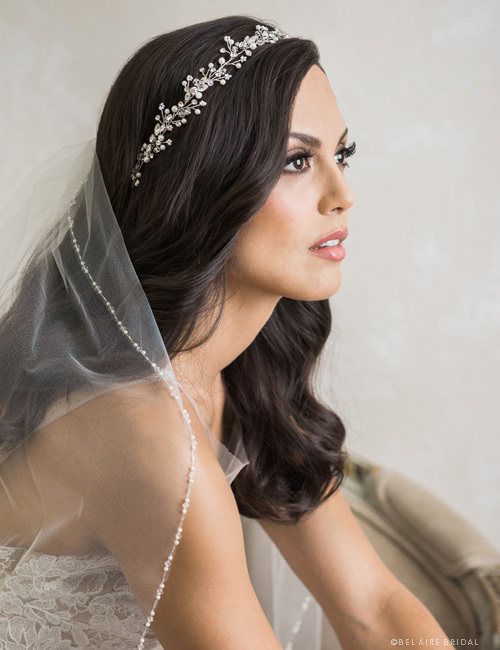 Enrich your wedding day ensemble with a gorgeous tiara packed with glittering rhinestones. Sparkling with starry splendor, this lovely design tops off any princess-inspired gown with ravishing beauty. Wear it with a veil and opulent rhinestone jewelry to complete a dreamy look. 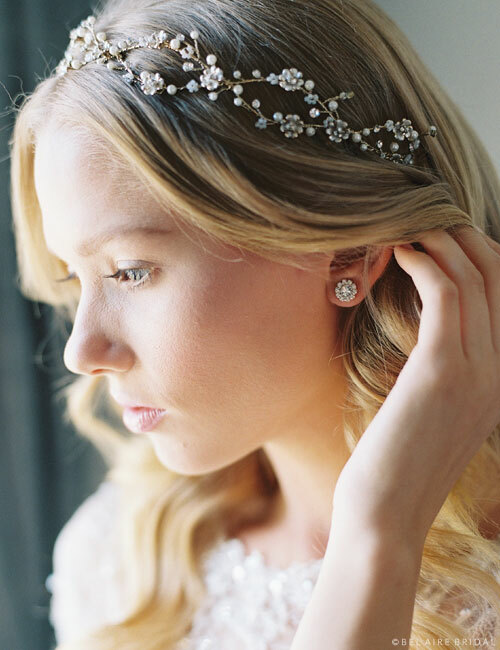 Step into a fairy tale wearing a delicate, twinkling headband. Sparkling center stones and a narrow line of shimmering rhinestones create a fantastic accent for your wedding wardrobe. 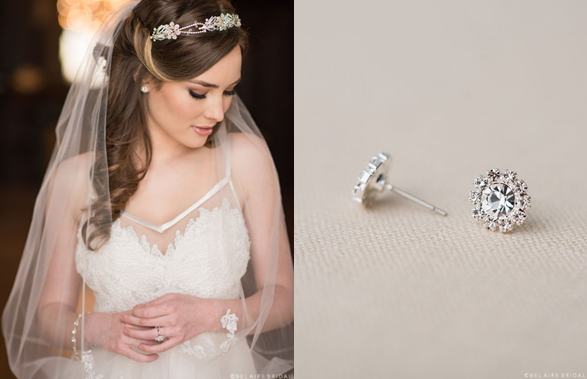 Complement this romantic design with a graceful veil and elegant drop earrings. Want to see more? Match your chosen headpiece with our bracelets and earrings that are now available in rose gold! Ever wonder why engagement rings cost so much? A lot goes into that bit of bling besides just the 4 C’s (cut, carat, clarity, color). 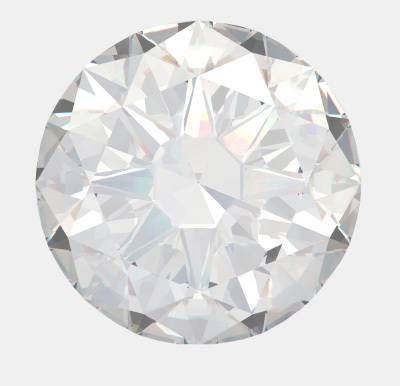 The setting and origin of your diamond, for example, play a role in the overall cost—as well as where you buy it, the warranty, and so much more! 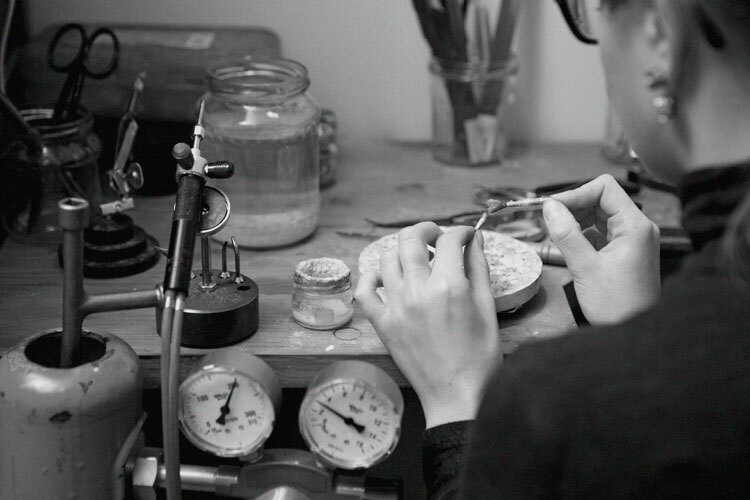 So we sat down with an Accredited Jewelry Professional (and bona-fide expert on gemology) to get the inside scoop. Here are five secrets about the diamond industry you should know before you say “I do” to that sparkly engagement ring. Quality matters more than quantity. 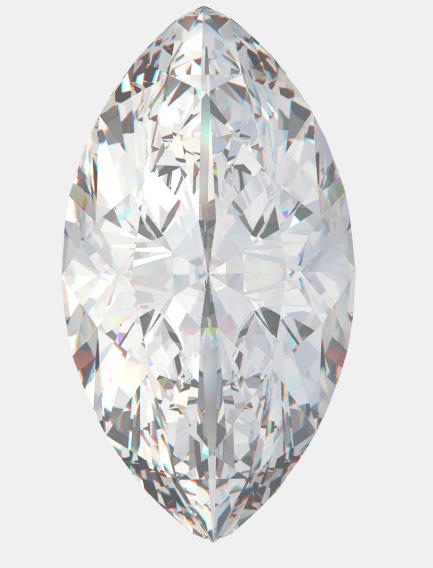 A lot of shoppers are impressed by carat, but it’s not just the size that counts. For a truly gorgeous ring, focus on quality. 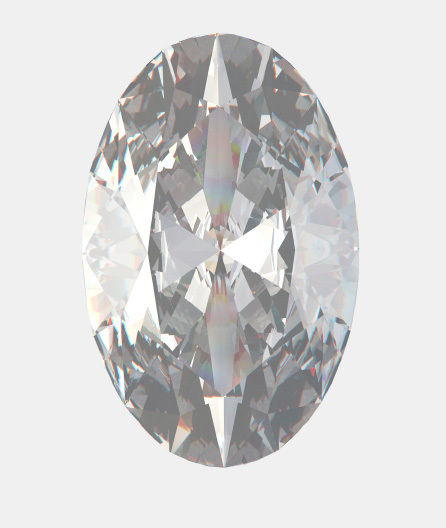 Consider the clarity and scintillation of your stone. What is the color grade? Are there inclusions? How was it cut? 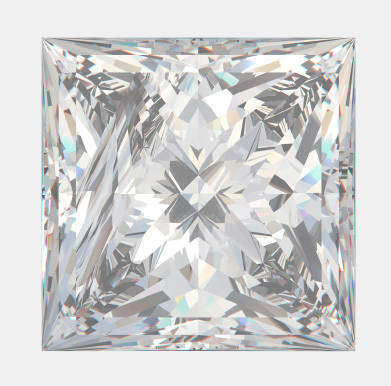 A brilliant cut gem such as a round or princess diamond will hide imperfections better than a step-cut gem such as an emerald-cut or baguette-cut diamond. Conflict-free is harder to find than you’d think. Many of the big jewelry chains cannot guarantee a conflict-free stone. Be aware of where your diamond comes from and get your stone from a certified, ethical source. Thanks to online resources, it’s much easier to find out of the store’s claims are legit. Also, you should be able to ask questions and get a detailed, intelligent response. Your ring is an investment. If the salesperson doesn’t seem to know what they are talking about, go elsewhere. What the ring represents matters. 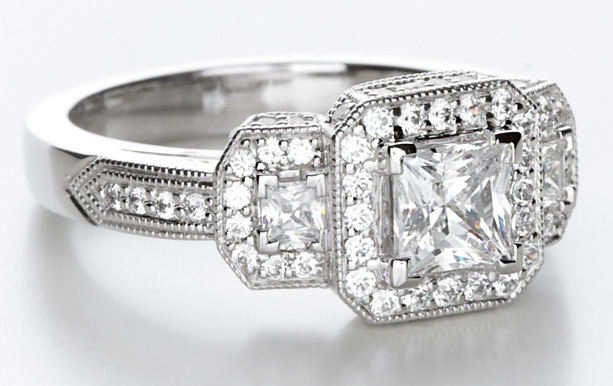 An engagement ring is more than just how much sparkle you can get for your buck. Your ring purchase symbolizes the promise of a life together, so consider your situation when picking a design. For example, avoid spending a ton if you are saving for a house or paying off debt. 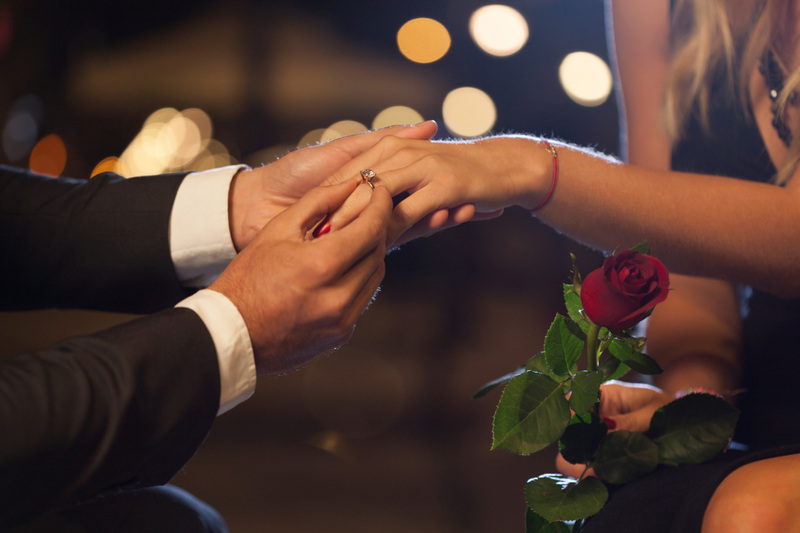 Choose a ring that best fits you right now, as a couple. While you shouldn’t settle for poor quality or a style you don’t like, remember that you can always add bands or upgrade in a few years for an anniversary or big life event. Think you can throw a ring on your finger, and it’ll be good for 30 years? Um, not so much. Proper maintenance is important because the metal band gets worn down from everyday use and chemical exposure. 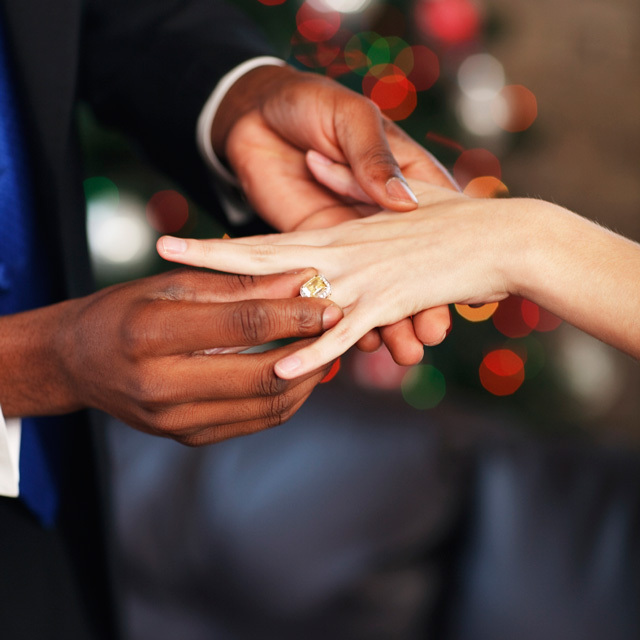 Avoid applying lotions when you are wearing your ring, and skip generic jewelry cleaners. Stores will clean your ring with steam or an ultrasonic treatment, so take it in every six months (or at least every year) for a proper cleaning. Diamonds can scratch the metal or fall out if the settings are loose. If you suspect a damaged setting, immediately snap a photo and take your ring in for repair. Protect your ring with insurance and safe keeping. Your ring is made of precious metal and delicate stone, so treat it kindly. Get insurance so you won’t have to pay if it gets stolen or damaged. When you do take it off, keep it on a ring holder or put it in a trinket dish so it doesn’t get lost. Most gold blends and silver bands will tarnish over time because the metal slowly oxidizes when exposed to the air. When possible, store it in a bag or box. Even if it looks fine, take the ring back to the shop for routine cleanings and inspections. Overall, you should choose a meaningful engagement ring that is right for your financial situation. As with a relationship, you can’t just forget about it and expect it to last. Take excellent care of your ring and you’ll be able to pass that bit of sparkly on to the next generation. a bit of sparkle goes a long way! We are head over heels in love with this incredible photoshoot by Amanda Lauren Photography and Michele Wilderman Styling. This bride and her maids totally rock show-stopping, vintage-inspired outfits that take glamorous to a whole new level. From mixing different bridesmaids’ dresses to adding dazzling belts, you can style your friends in unforgettably gorgeous ensembles. 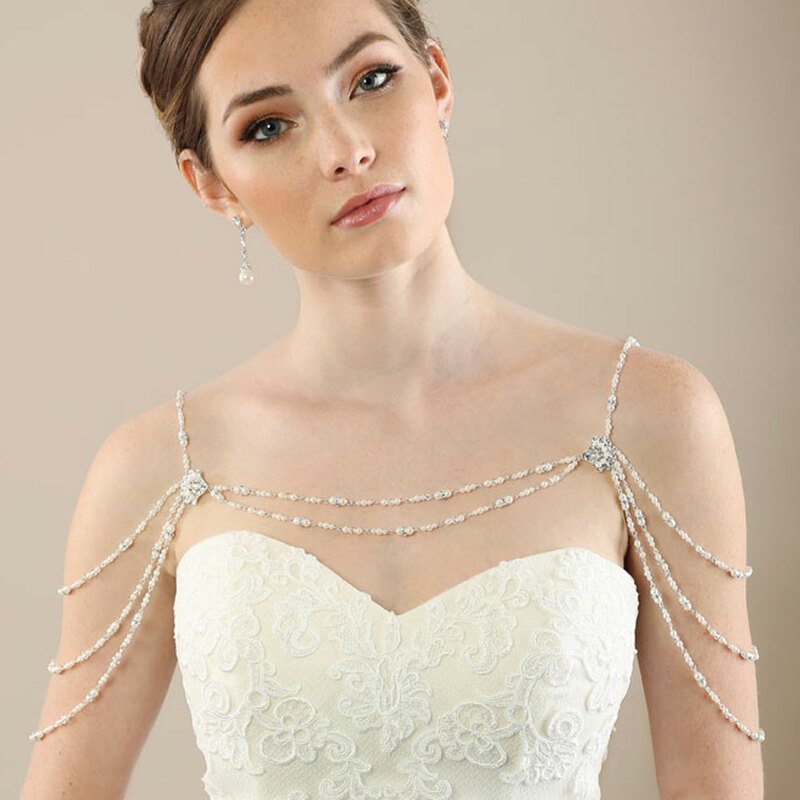 Big trends for 2016 weddings include sequin gowns, beaded vintage dresses, and statement jewelry. Liven up the party with fabulous, flirty headpieces! 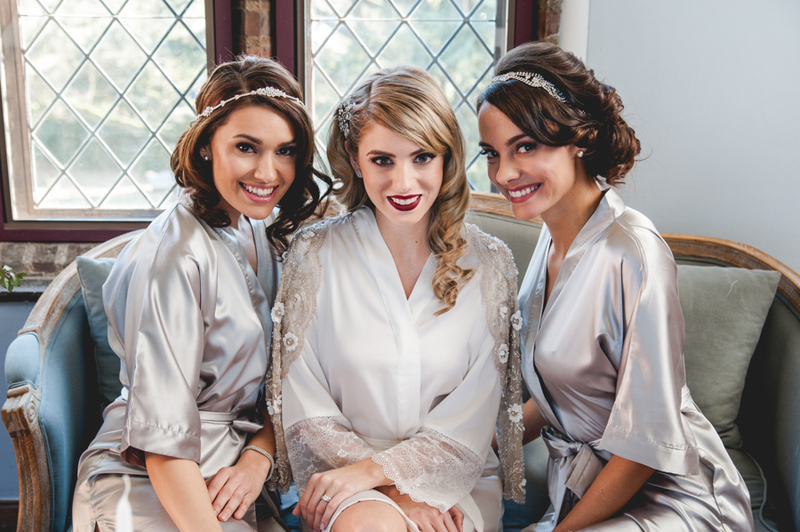 Dazzling halos, feminine clips, glittering headbands, and shimmering combs offer each of your bridesmaids the opportunity to create a signature look. Better yet, lay out some options and let each person pick her favorite! Keep your MOB, MOG, and MOH in the loop. These beautiful additions to your wedding party also double as fun gifts for mothers, sisters, and besties. 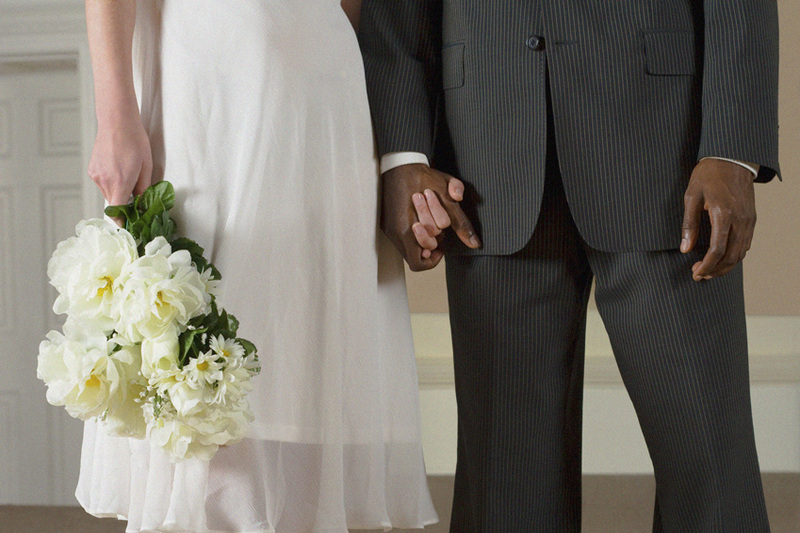 Your wedding is a special day for everyone else in your life, too! Why not make it amazing? Check out our Spring 2016 collection for some hot-off-the-runway designs for your wedding. Want more inspiration? 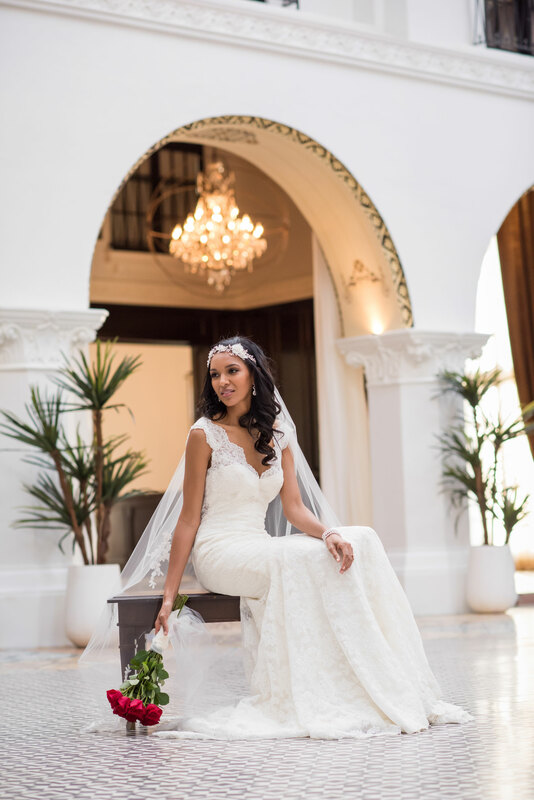 Browse our My Bridal Style Glamorous and Vintage pages, and be sure to follow us on Instagram for more amazing eye candy. Designers, photographers, and bloggers celebrate the Pantone Color of 2016 with trendy products and inspirational stylings. Rose Quartz is a beautiful blush pink that has long been a bridal favorite. The namesake of this lovely shade is a crystal commonly known as the “love stone” or “heart stone.” It symbolizes unconditional love and is supposed to increase compassion, open your heart to relationships, ease stress, strengthen connections, and boost self-esteem. 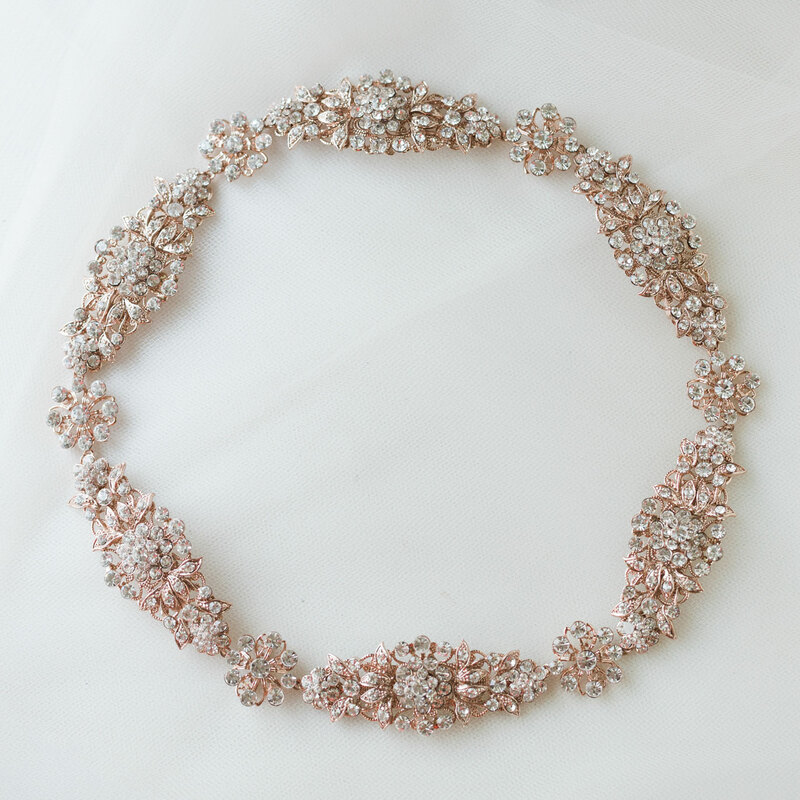 Feminine and graceful, blush pink is often featured in dramatic wedding gowns and beautiful floral headpieces. This shade is especially popular in the spring (though it looks great in any season) and pairs best with warm gold jewelry for a romantic ensemble. Serenity is a soft blue that inspires security and confidence. Tranquil and spiritual, blue is generally a color of trust, honesty, and loyalty. In the world of weddings, “something blue” symbolizes everlasting fidelity. 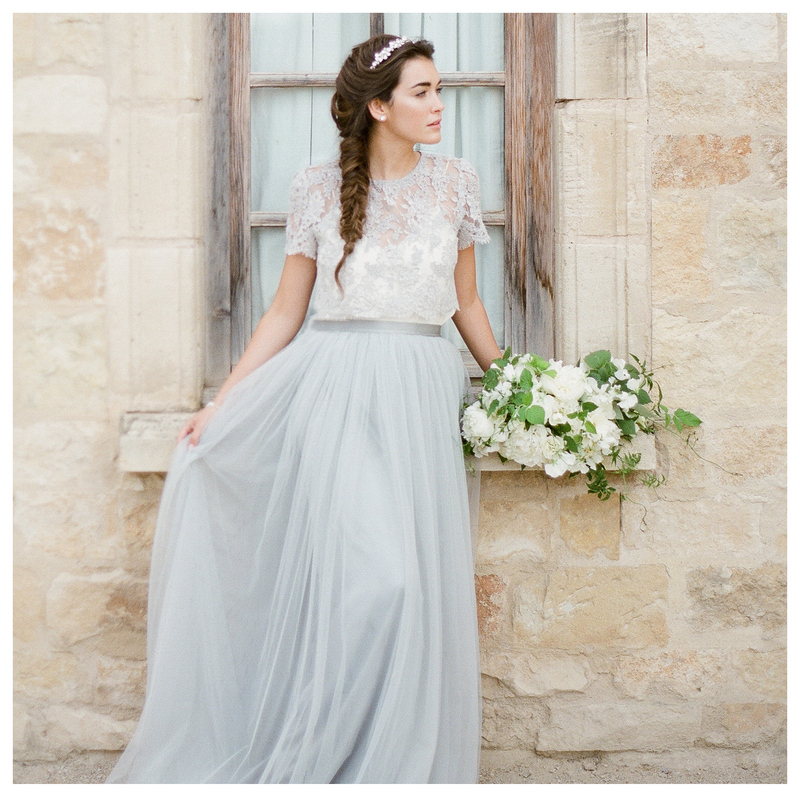 Light blue is a popular shade for winter celebrations and brings balance to spring pastels. 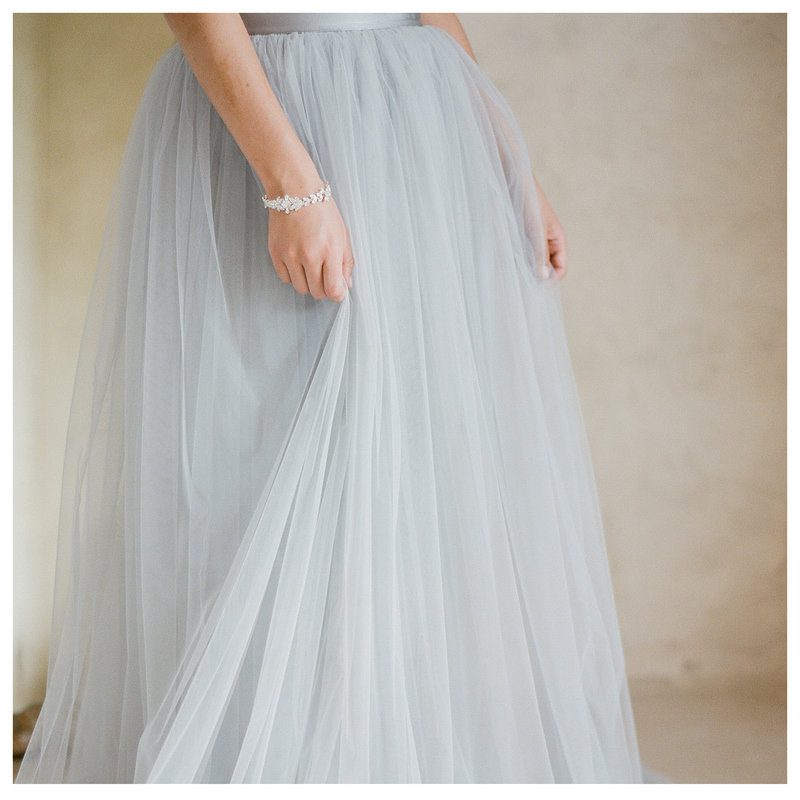 Pair an ethereal blue tulle skirt with a lace top for a cute reception outfit, or choose a smaller color accent like a garter or sash for your something blue. 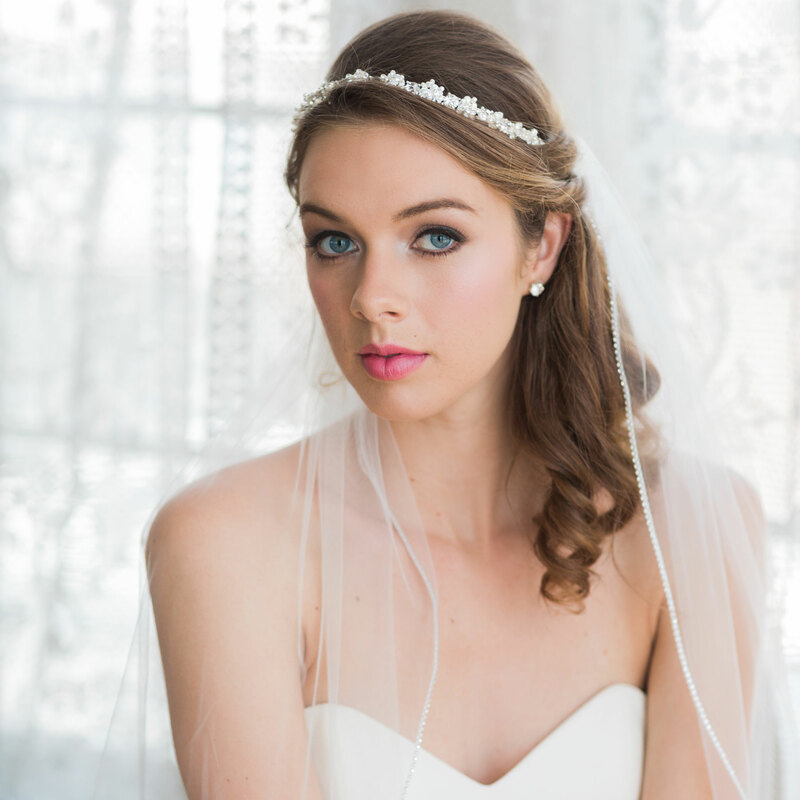 Trendy opal headpieces, silver beaded belts, and soft veils beautifully complement this peaceful hue. Check out our Pantone—Serenity & Rose Quartz Pinterest board for more gorgeous color inspiration! Engagement Ring Cuts—Which Is Yours? 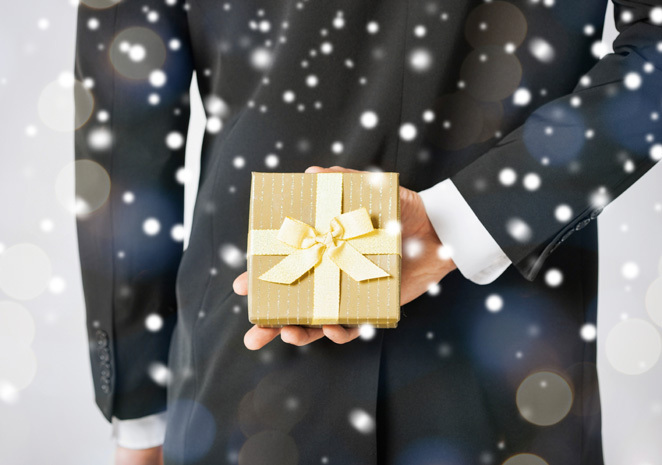 With the holidays just around the corner, we’re coming up on engagement season! Whether you’re dreaming of a sparkly present or already window shopping, take a peek at the different cuts. Find out which one is yours and what it says about your bridal style! You are traditional, romantic, and devoted. 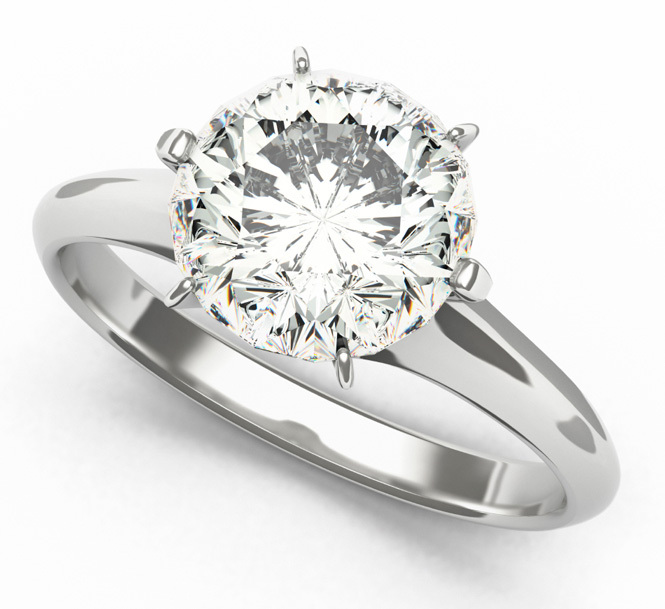 You want a pretty, sparkly solitaire that will still look incredible in twenty years. 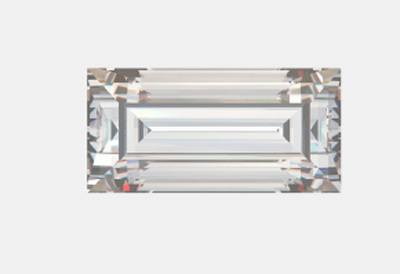 The round cut is the most popular for good reason—you get brilliance, fire, and scintillation all in one package. Your Bridal Style: Romantic. You’re more interested in having a beautiful marriage than an over-the-top wedding, and you prefer your details to be thoughtful and timeless. You’ll be looking at family traditions for inspiration. Our Top Picks: Styles with pearls and lace. 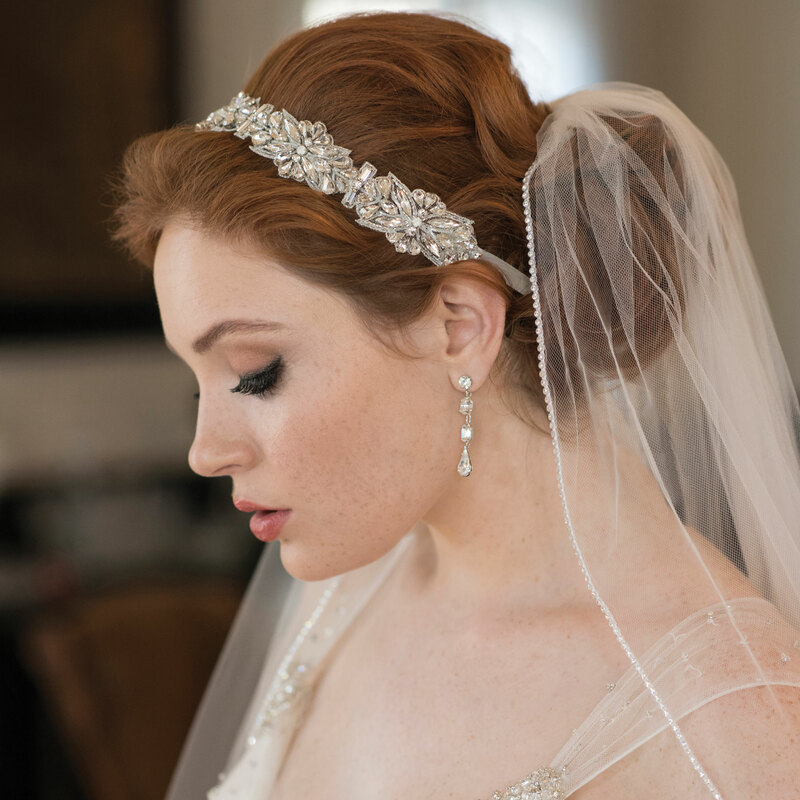 Consider our top headpieces like 6435, 6161, 6202, and 6534. Check out our Lace Veils and Cathedral Veils to best complement your gown. You are grounded, modern, and artistic. You like traditional sparkle coupled with an edgy shape. While you’re not very interested in celebrity trends or over-the-top romance, you still want a ring that looks stylish with just a touch of feminine charm. Your Bridal Style: Trendy. 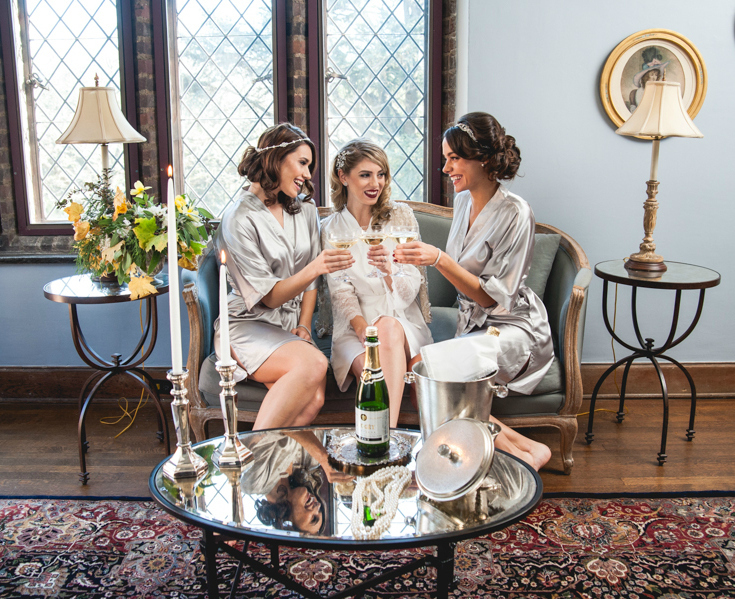 Your wedding will be personalized, skipping outdated traditions and frivolous details. Your look blends modern elegance and rustic beauty. Our Top Picks: Metallic florals. Consider creative designs like 6505, 6522, 6452, and 6644. Check out our Embroidered Veils and Classic Veils to best complement your gown. You are trendy, classy, and feminine. Though you want the sparkle and fire of a round cut, you adore the just-a-bit-different charm of an oval ring. 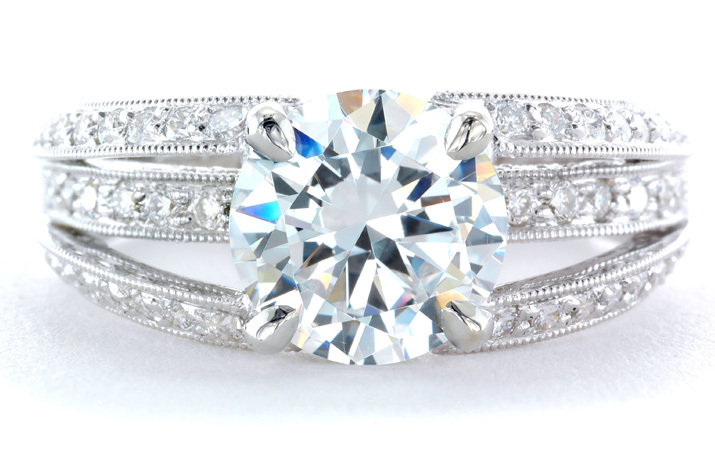 You are modern and want a band or halo adorned with plenty of small diamonds. Your Bridal Style: Trendy. Though you enjoy a few classic elements, you want your celebration to be modern and fresh, with just a hint of glamour. You’ll be looking on Pinterest and at celebrity weddings for inspiration. Our Top Picks: Anything with opal crystals and rhinestones. Consider our newest styles like 6600, 6615, 6617, and 6628. Check out our Classic Veils and Cathedral Veils to best complement your gown. You are elegant, classy, and empowered. 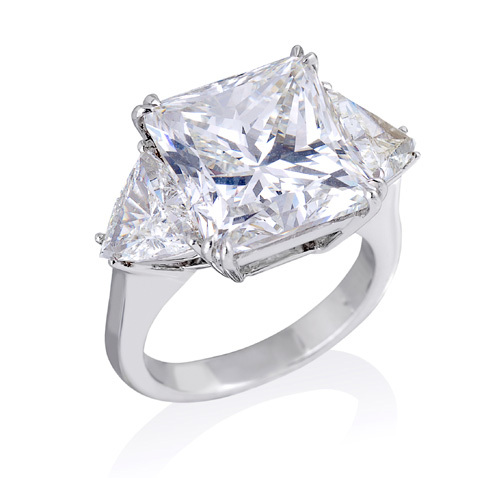 You want a distinctive, brilliant ring that flashes rather than sparkles. Not given to sentiment, you want a high-quality statement stone that reflects your individuality and good taste. Your Bridal Style: Classic. Modern but not trendy, you want a sophisticated black tie wedding marked by flawless simplicity and streamlined elegance. You’ll be choosing top-of-the-line vendors. 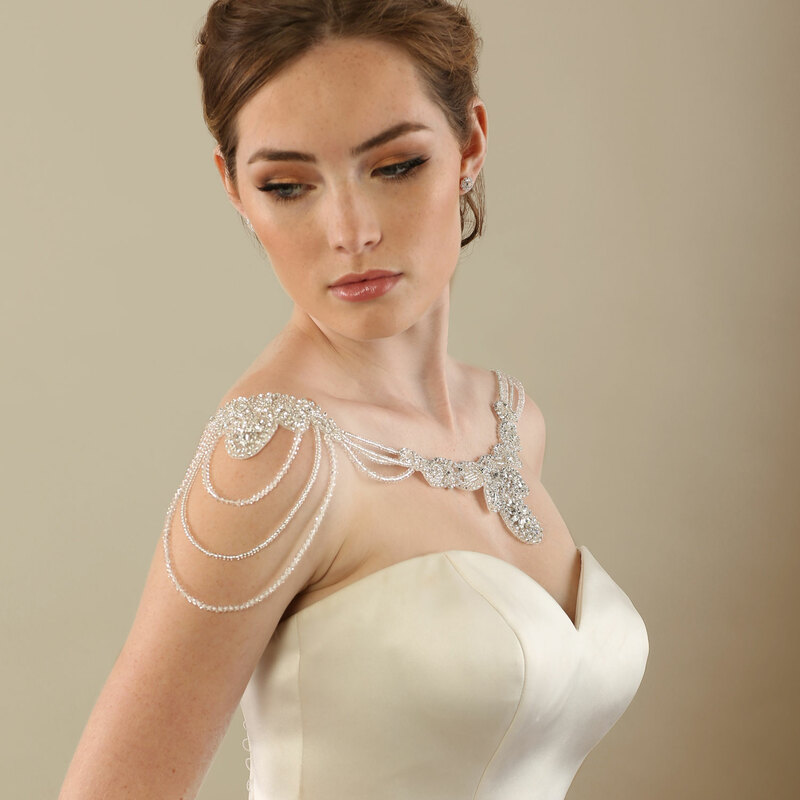 Our Top Picks: Elegant rhinestone designs. Consider styles like 6284, 6557, 6533, and 6513. 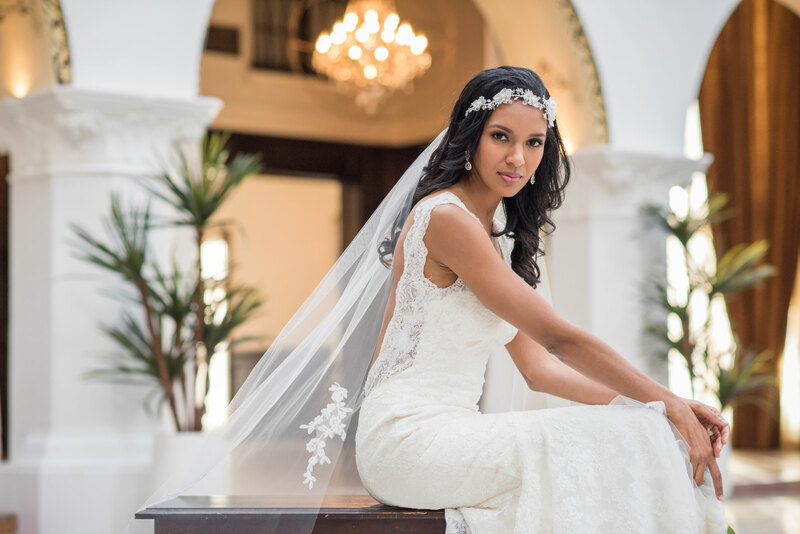 Check out our Classic Veils and French Net Veils to best complement your gown. You are outgoing, creative, and vintage-obsessed. You love any trend that calls back the fashions of previous ages. The courtly marquise looks amazing on your hand, and you love showing it off. Your Bridal Style: Vintage. You are all about opulence and over-the-top sparkle. Your look is glamorous, daring, and totally retro. Our Top Picks: Vintage-inspired bling. Consider styles like 6310, 6351, 6354, and 6400. 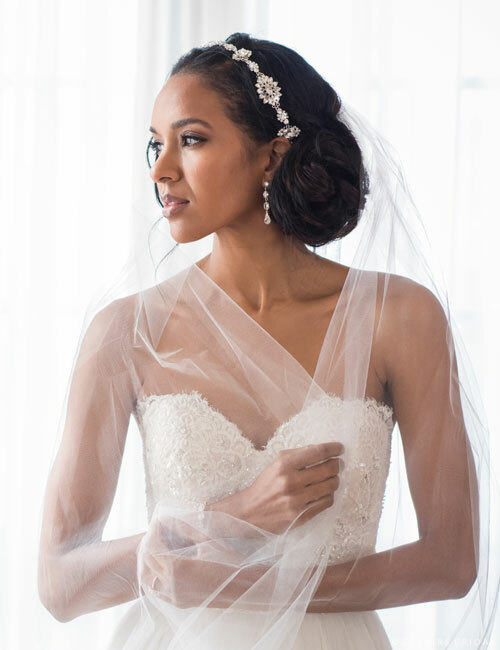 Check out our Beaded Veils and French Net Veils to complement your gown. You are sentimental, modern, and free-spirited. You have a penchant for feminine sparkle, but shy away from the traditional solitaire. One ring won’t cut it—you love the dramatic beauty and symbolism behind adding a ring for every major life experience, starting with your engagement. 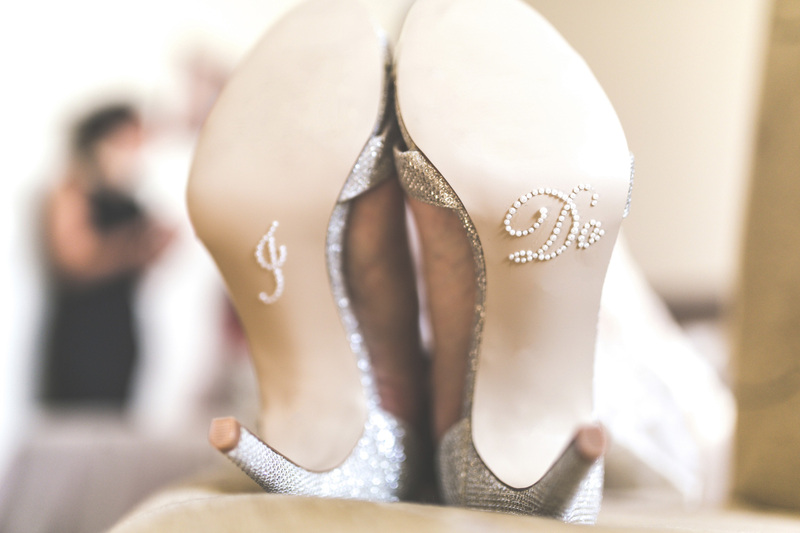 Your Bridal Style: Glamorous. You want your wedding to be personalized, with extra-special glamour and romance. You’ll look to Pinterest and ask friends for wedding inspiration. Our Top Picks: Anything fabulous. Consider sparkly styles like 6644, 6642, 6620, and 6610. Check out our Embroidered Veils and Cathedral Veils to best complement your gown. You are dramatic, outgoing, and trendy. You want a ring that will blow your socks off and look amazing, no matter how many times you see it in photos. 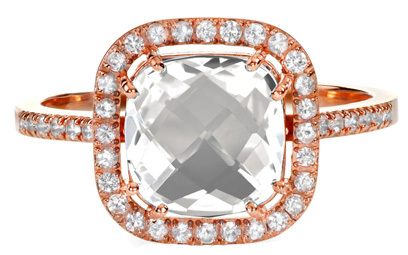 You want a solitaire with a halo, and maybe even a rose gold band. Your Bridal Style: Glamorous. You want your wedding to be epic. A bit of sparkle never hurt anyone. Our Top Picks: Bling and more bling. Consider our most sparkly styles, like 6603, 6611, 6627, and 6500. Check out our Beaded Veils and Cathedral Veils to best complement your gown. What type of engagement ring do you have? 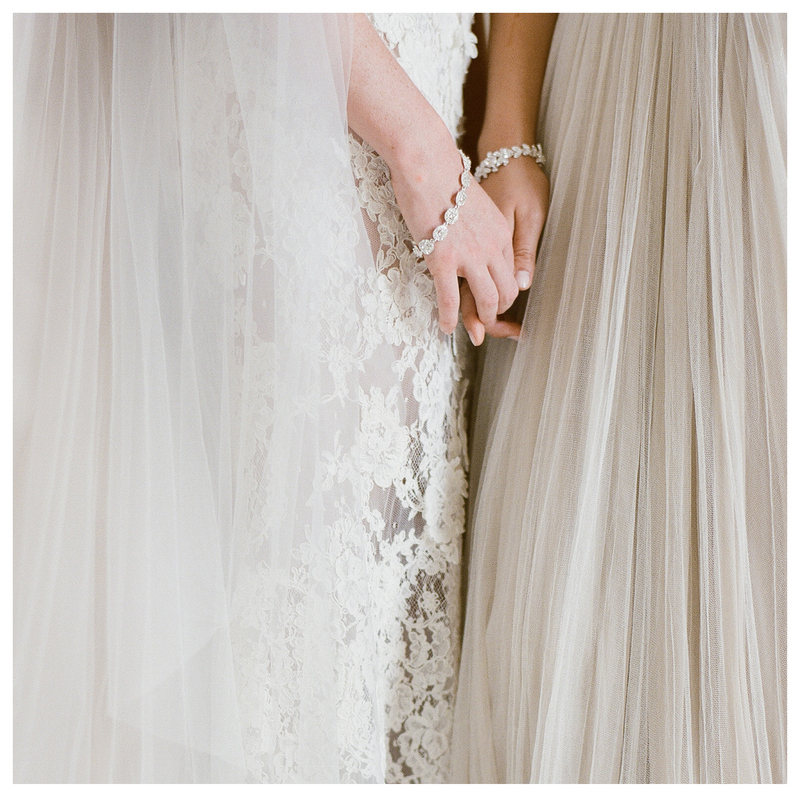 Tell us about your bridal style! Posted on December 11, 2015 December 11, 2015 Author Bel Aire BridalCategories Accessory Feature, BA Love List, Bel Aire Bridal 2015, Christmas, Fall 2015, Holiday, Jewelry, My Bridal Style, Pretty, Product Spotlight, Seasonal, VintageTags Accessories, Accessorize, BALoveList, Bel Aire Blog, Bel Aire Bridal, Bling, Bridal Accessories, Details, Love, Product Spotlight, Romantic, SparkleLeave a comment on Engagement Ring Cuts—Which Is Yours? 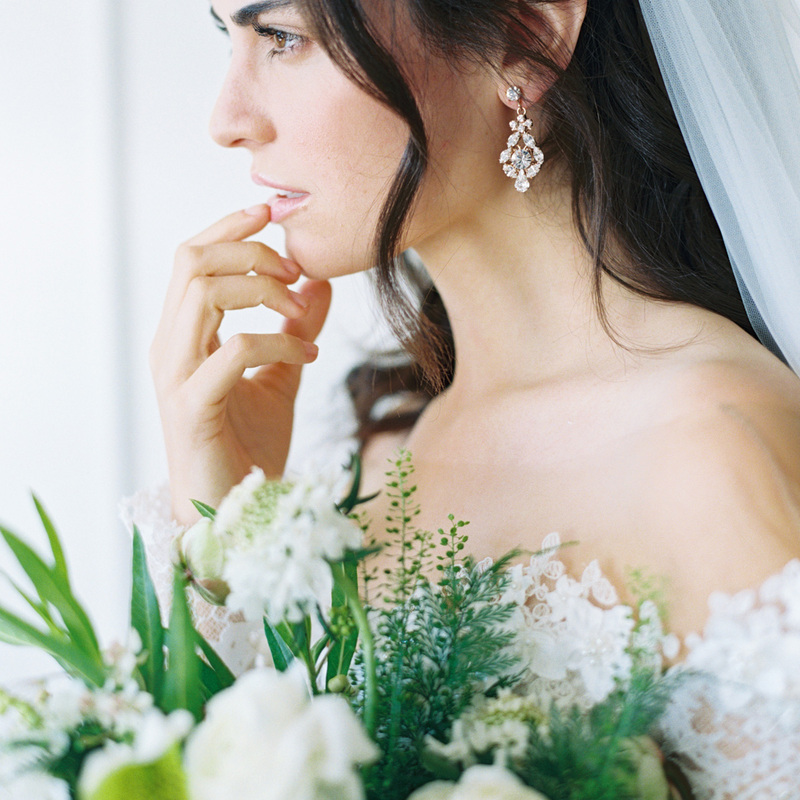 Your bridal look is so much more than a white dress. The accessories you choose create a total ensemble that expresses your personality in the most beautiful way. 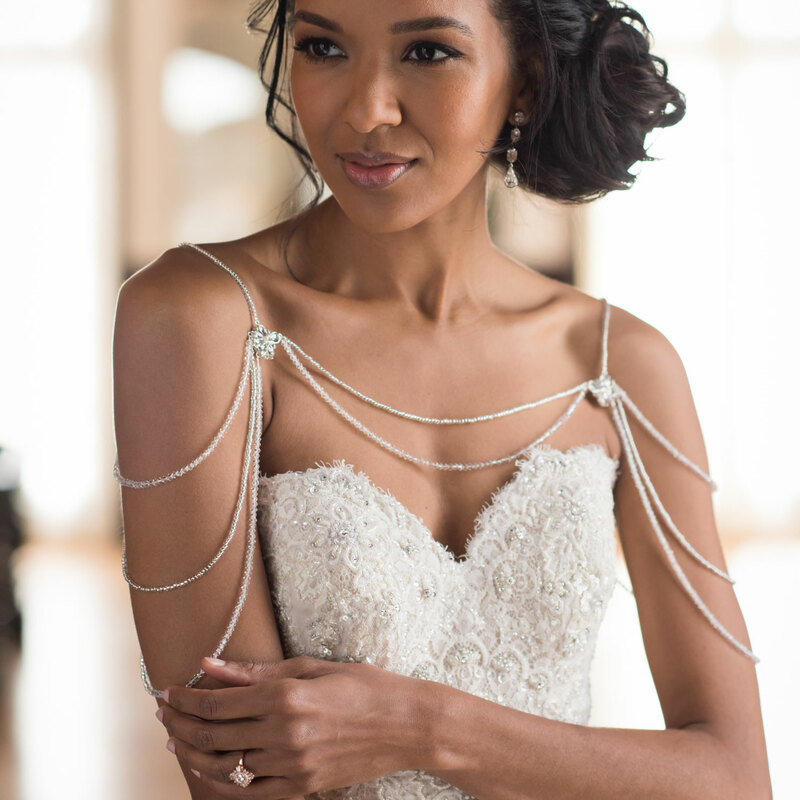 Belts, bracelets, earrings, and headpieces create a magical feeling of elegance that makes your wedding wardrobe feel truly special. With that in mind, we are so excited to showcase some of our most enchanting bits of sparkly. 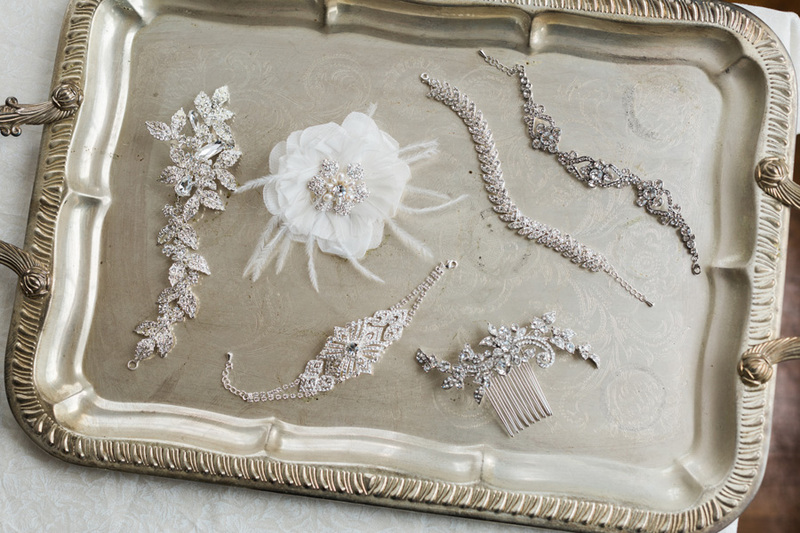 With rhinestone-encrusted bridal combs and glittering bracelets, this pretty, posh selection evokes a theme of opulent glamour. Scroll to discover your favorites! 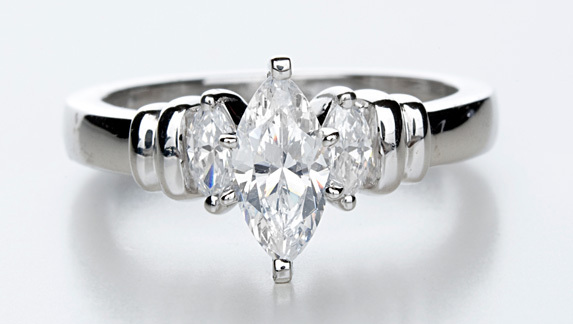 There’s something so charmingly graceful about these old-world style rhodium designs. Swirls and curls and glittering round rhinestones create a dazzling accent for a soft lace dress or ethereal tulle ball gown. 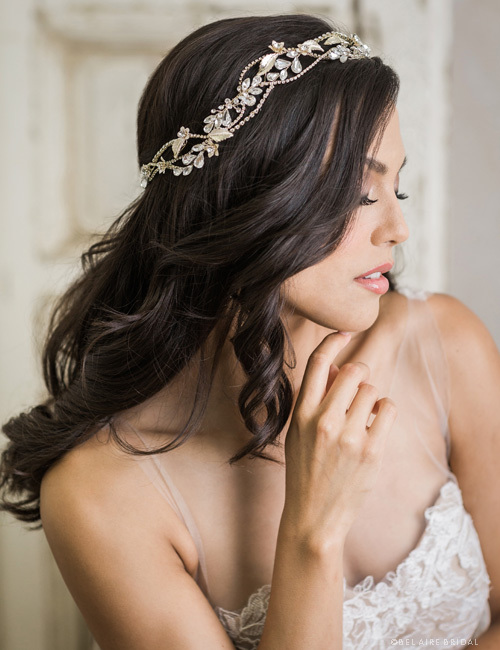 If you’re the bride seeking a touch of sparkle for her lovely locks, this stunning hair jewelry combines silver leaves and dramatic rhinestone accents in a totally boho-chic design. Slip a pretty, nature-inspired design onto your wrist for those close-up bouquet shots. A bit of bling adds unexpected beauty. Feel beautiful and feminine on the big day wearing a soft feather and organza flower in your hair. 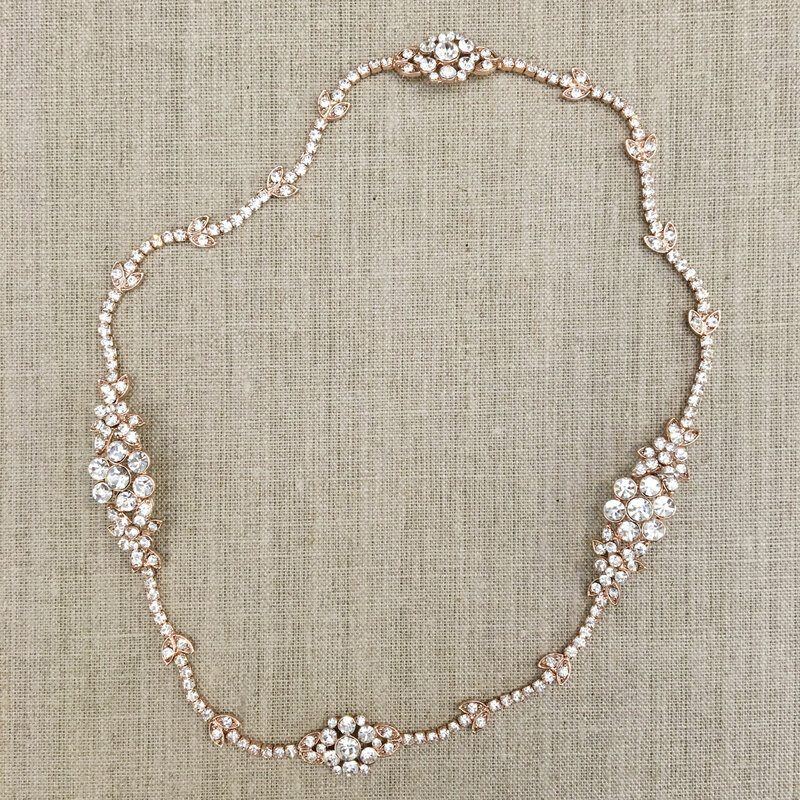 Lustrous pearls and sparkling rhinestones add a touch of glamour to this sweet accent piece. 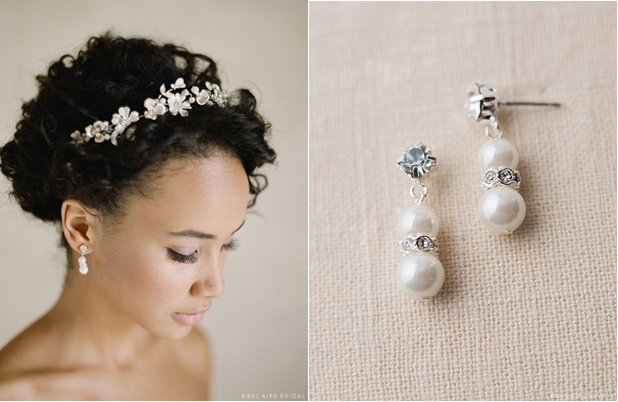 Tell us, how will you personalize your bridal look? Check out our My Bridal Style pages for more inspiration on the theme that best expresses your style, and feel free to peruse our latest collection for more eye-catching and utterly romantic designs.